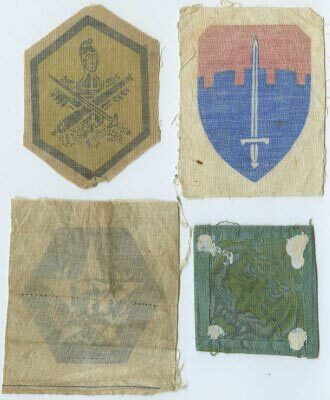 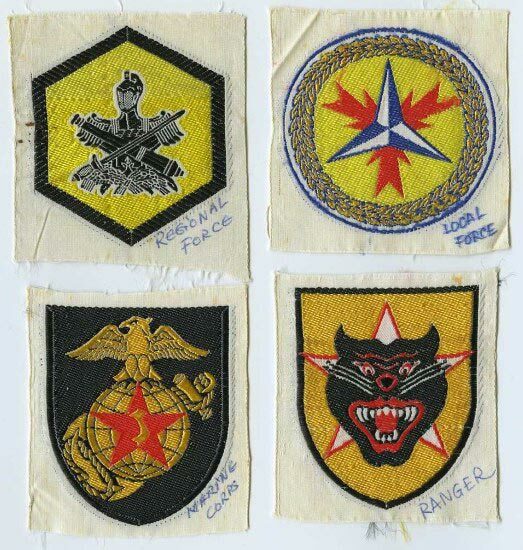 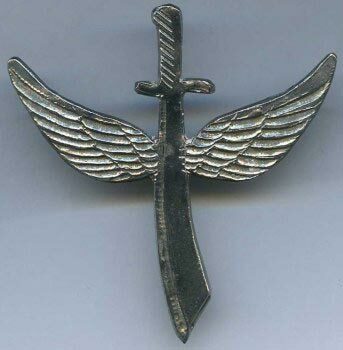 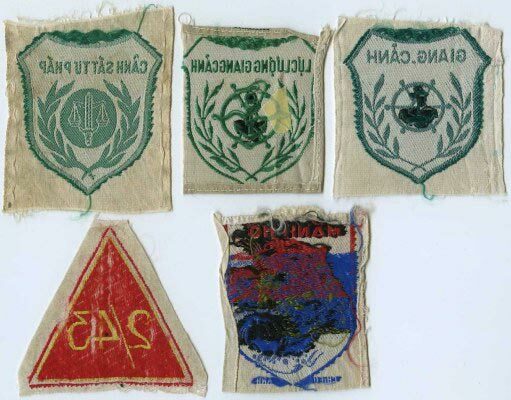 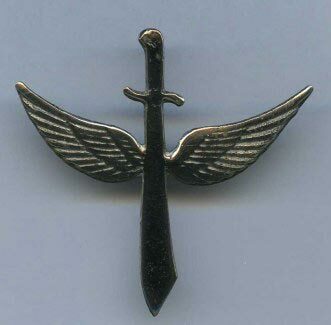 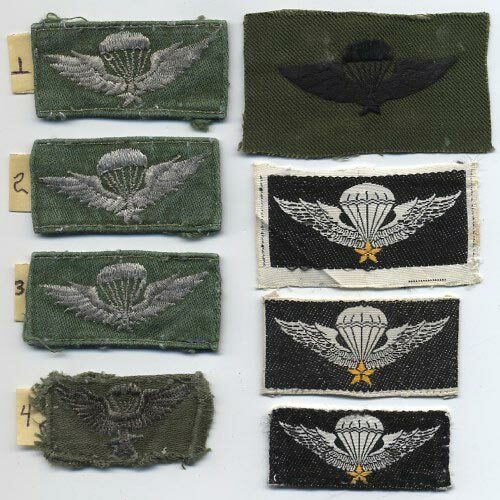 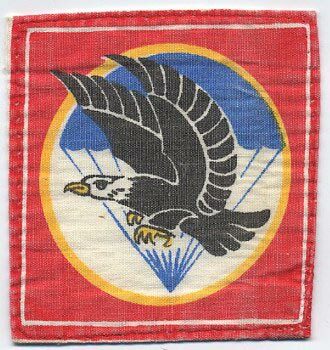 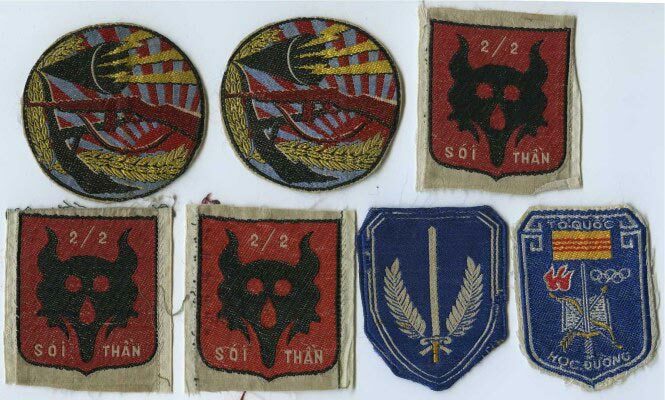 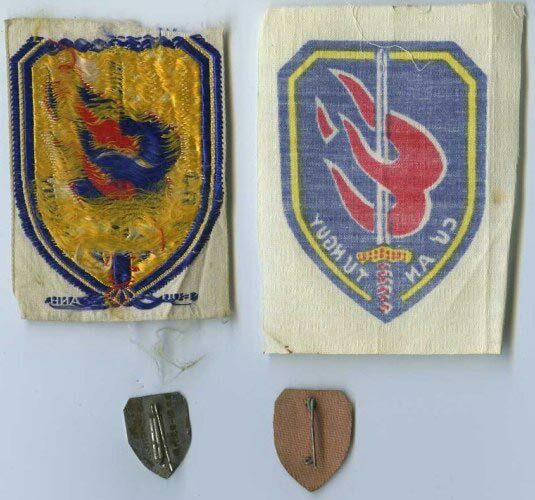 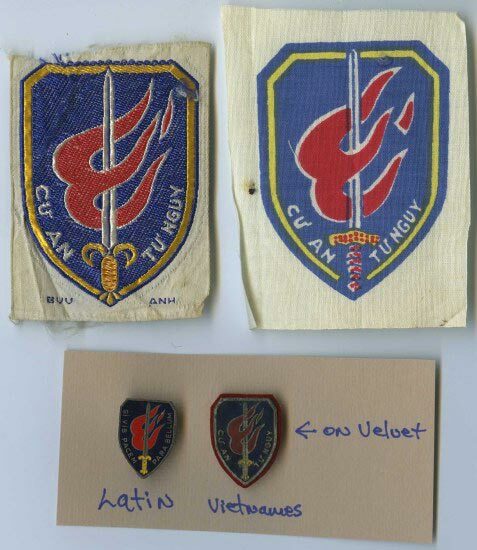 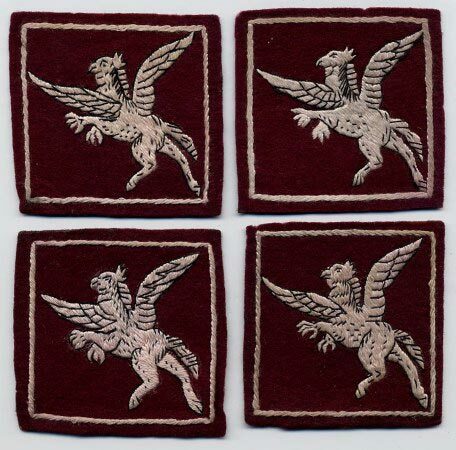 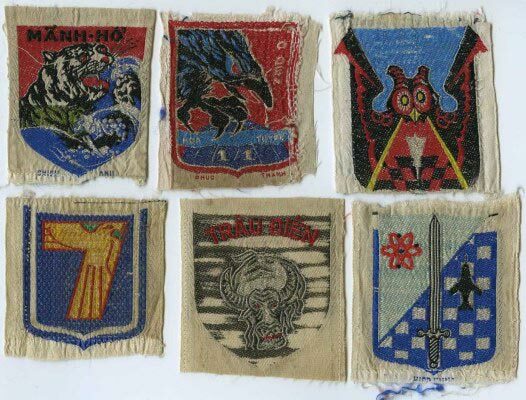 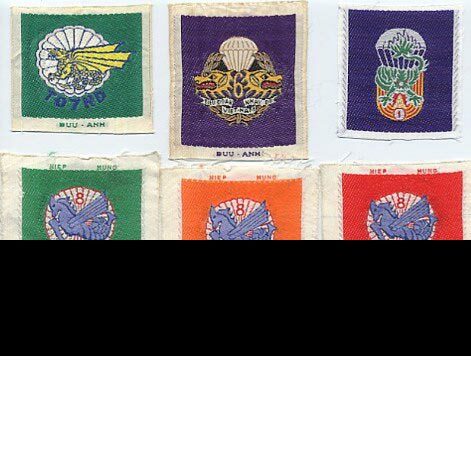 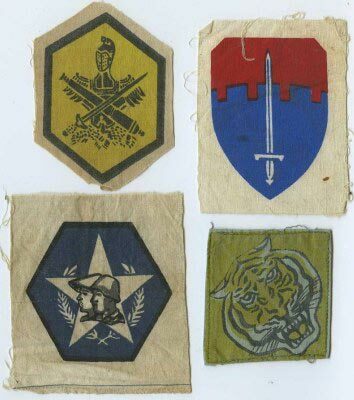 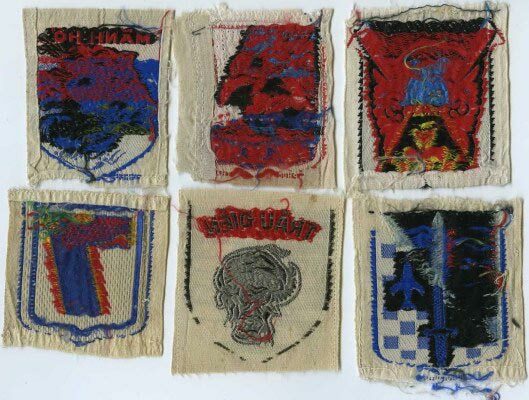 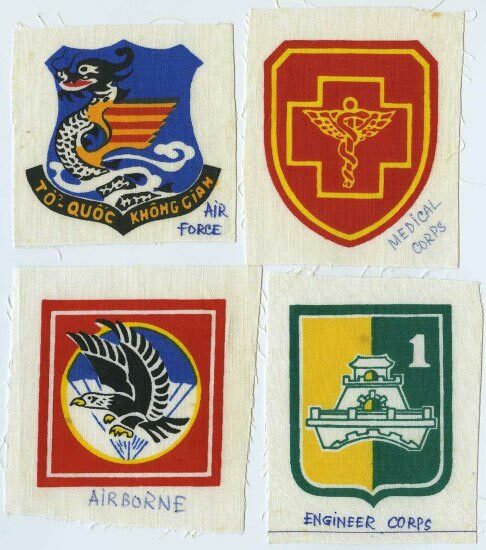 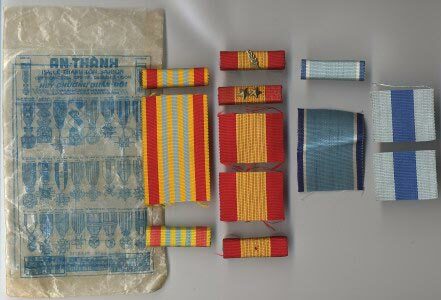 Airborne Air Force Air Vietnam Badges, DIs, Patches, & etc. 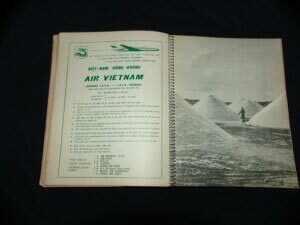 are for Static Display ONLY! 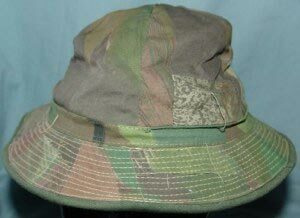 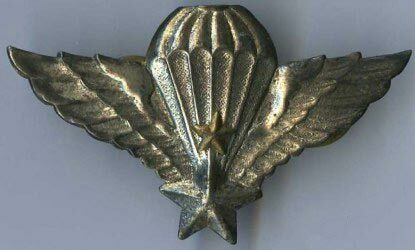 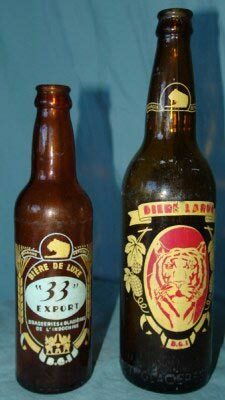 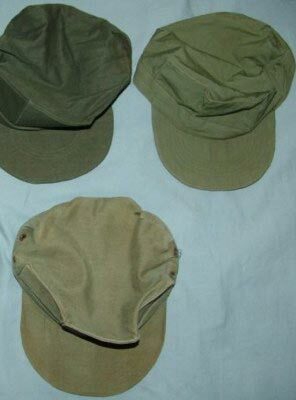 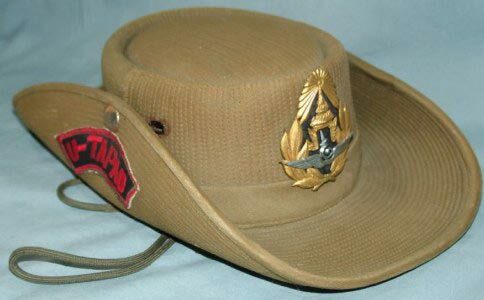 3370 - ARVN Cap "Ranger Camouflage"
"Brasseries et Glacieres de L'Indochine"
"BIERE BLONDE BRASSEE ET EMBOUTEILLEE SOUS LICENCE PAR BGI TIEN GIANG VIETNAM"
"A PARTIR DE MALTS & HOUBLONS SOIGNEUSEMENT SELECTIONNES"
"cont. 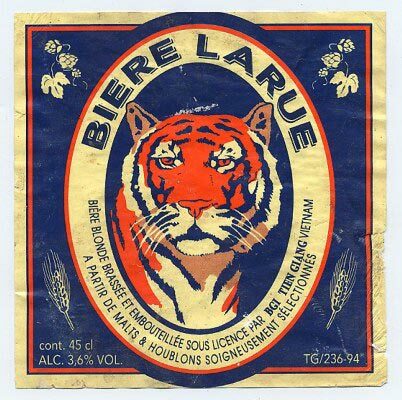 45 cl" "ALC. 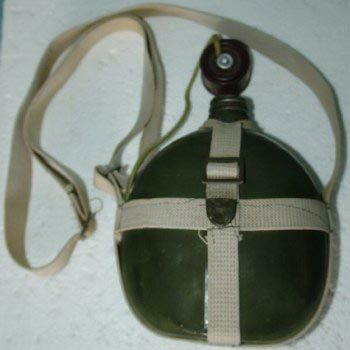 3.6% VOL." 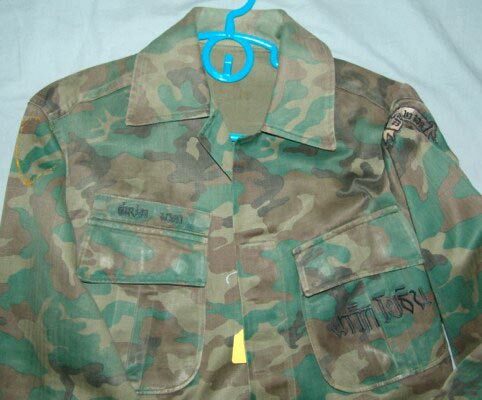 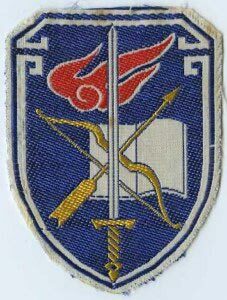 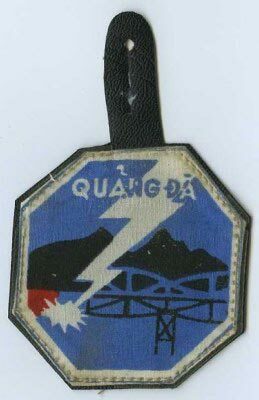 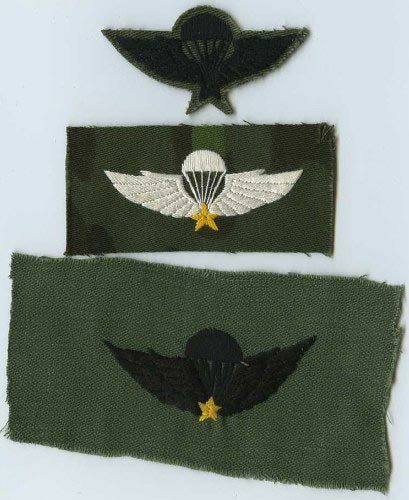 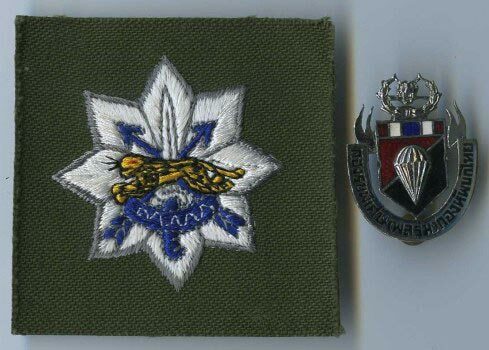 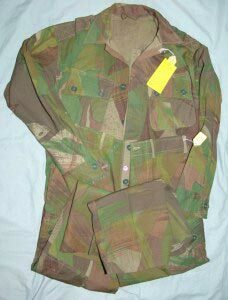 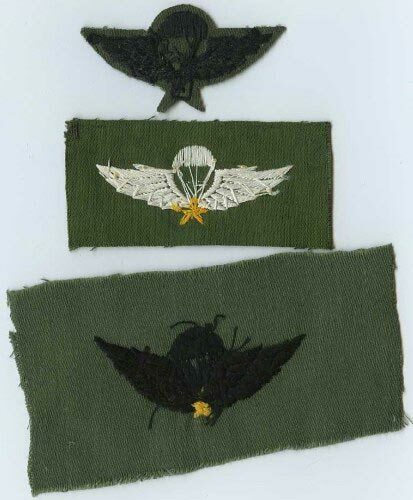 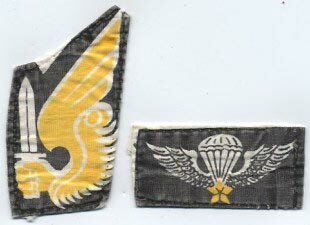 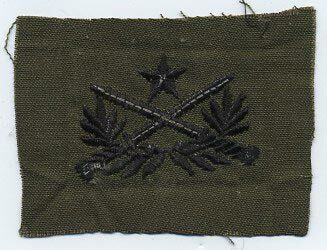 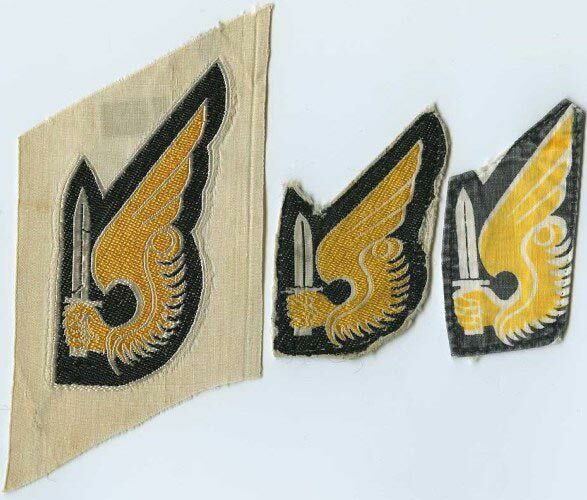 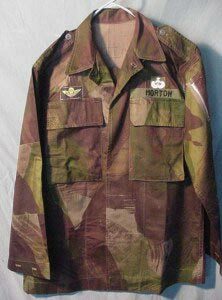 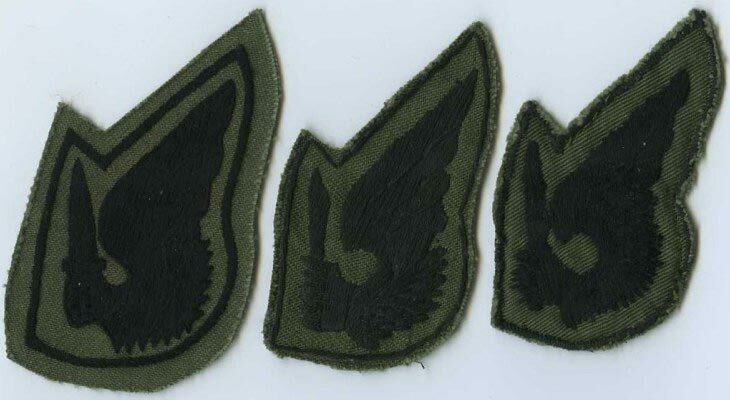 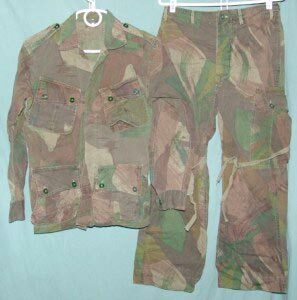 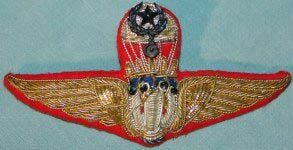 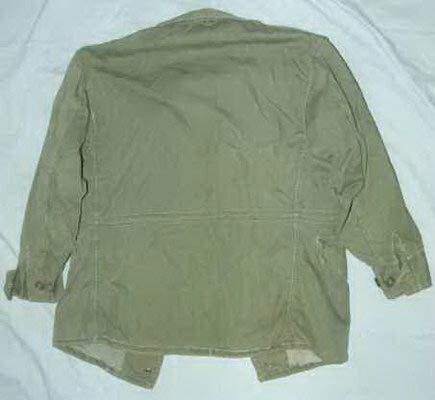 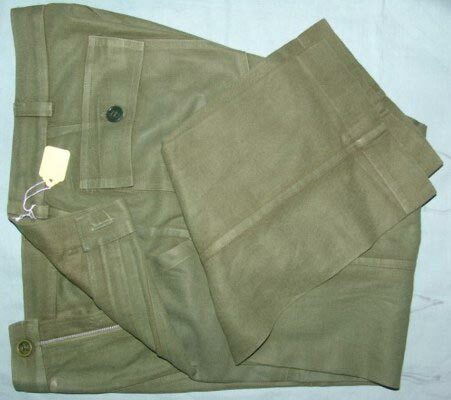 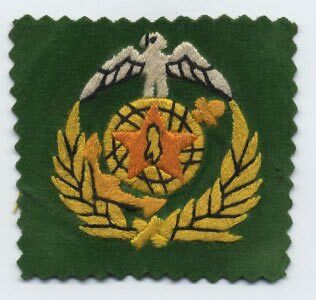 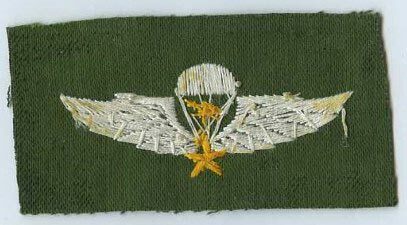 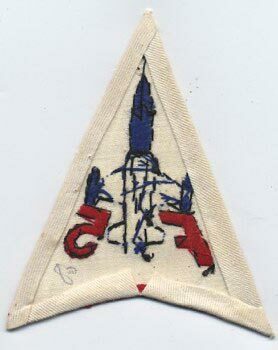 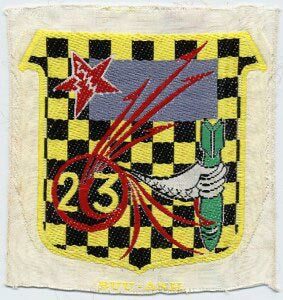 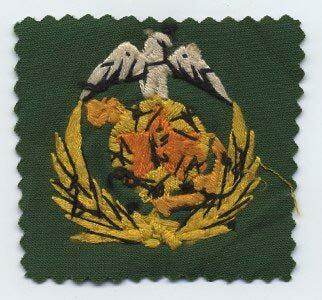 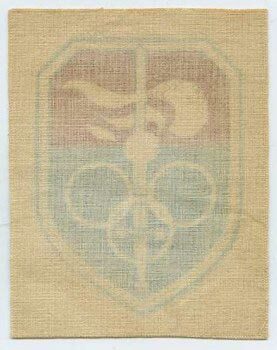 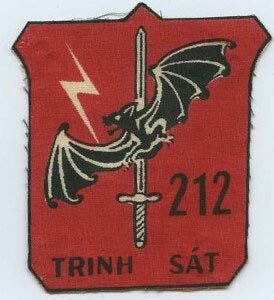 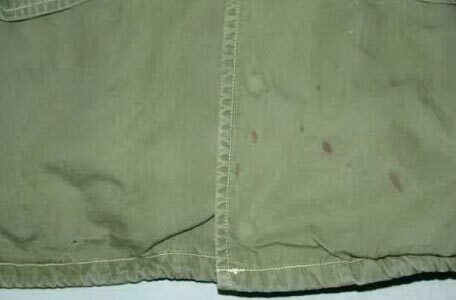 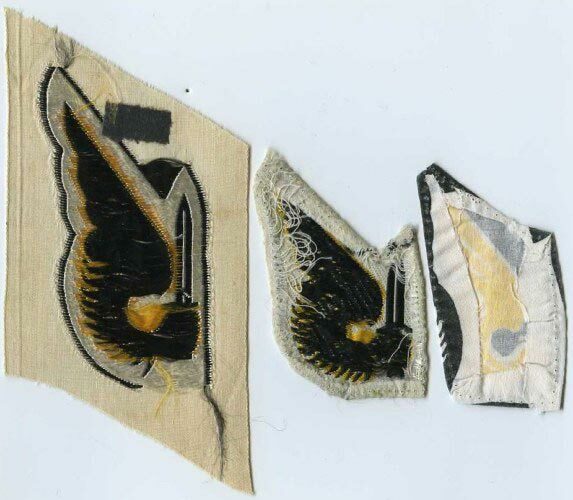 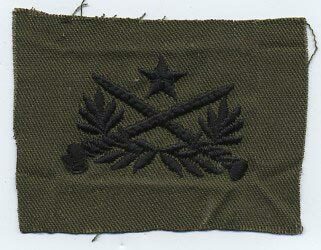 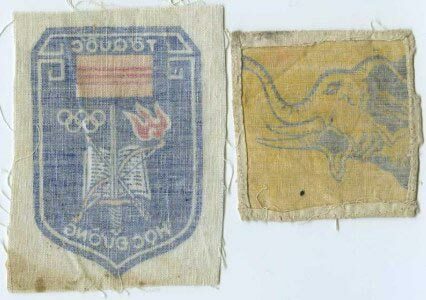 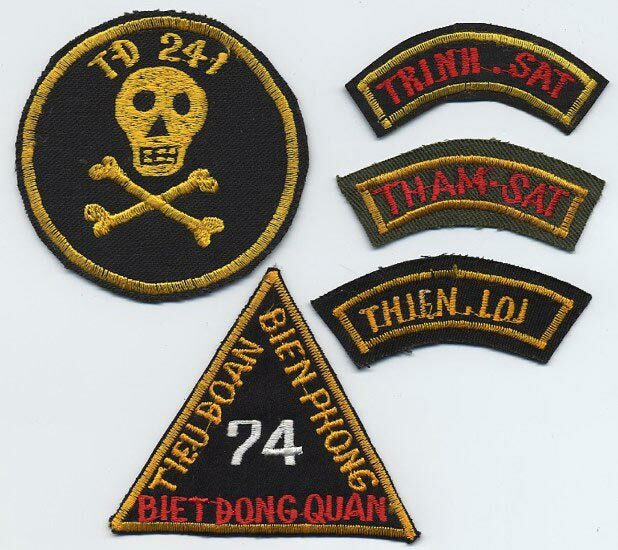 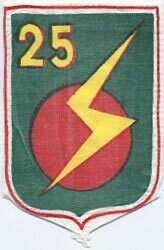 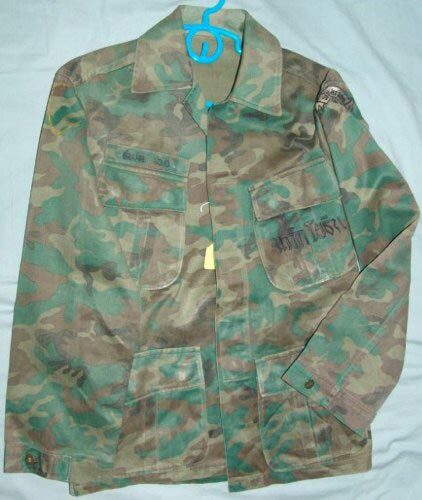 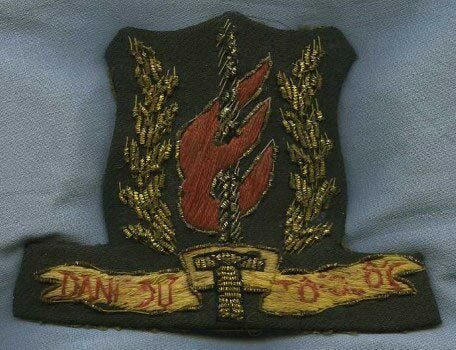 "TG/236-94"
DRAGO made "sideplate" for a Lighter"
approximate size 1 3/16" x 1 5/8"
3416A Vietnamese Air Force Officer's Tropical Worsted (TW) SummerJacket with patches. 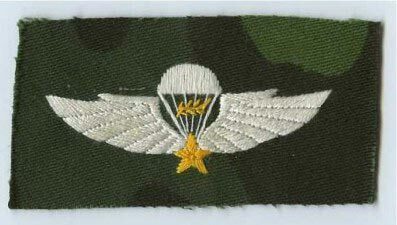 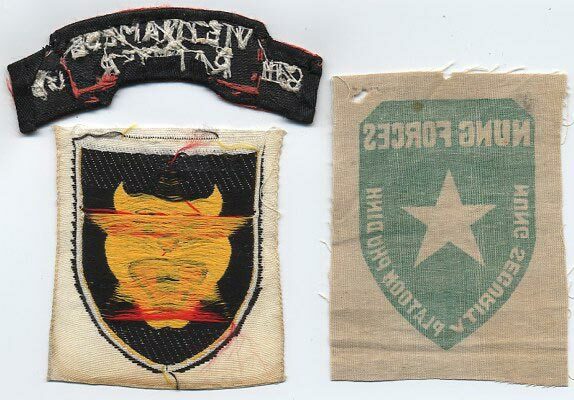 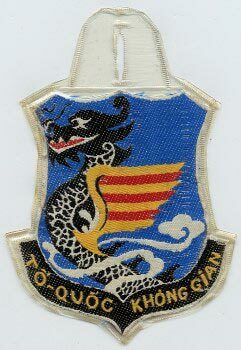 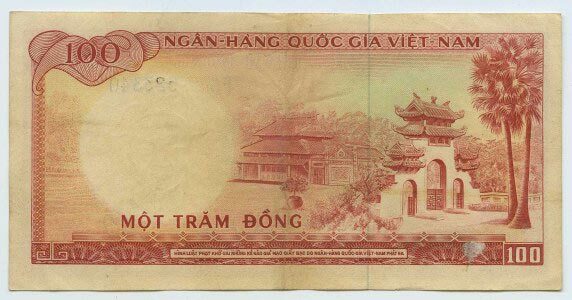 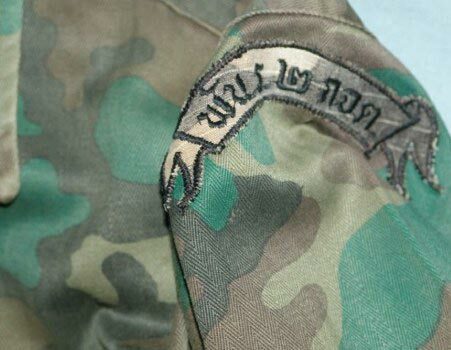 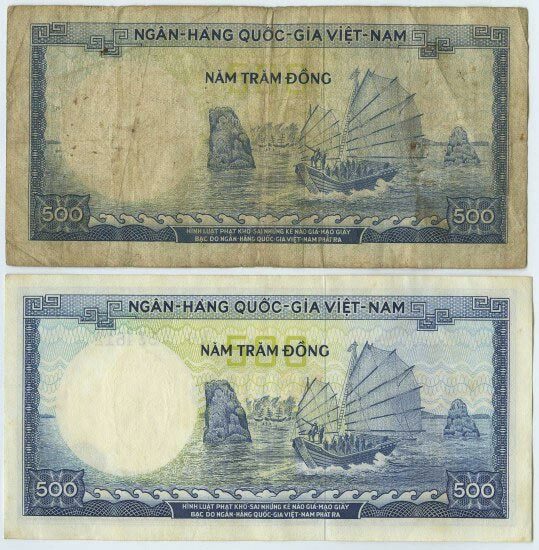 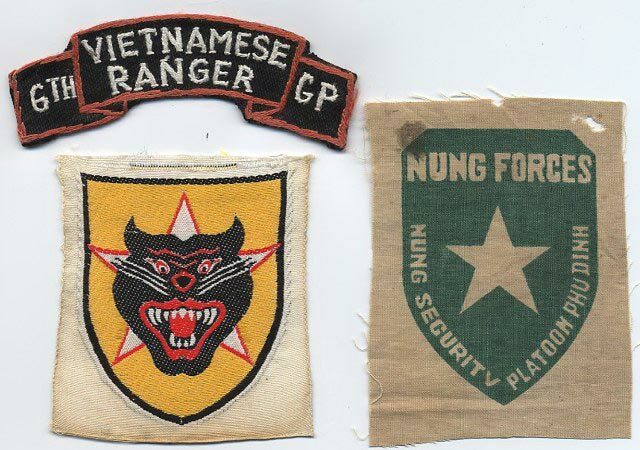 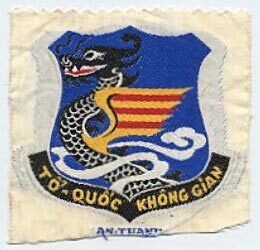 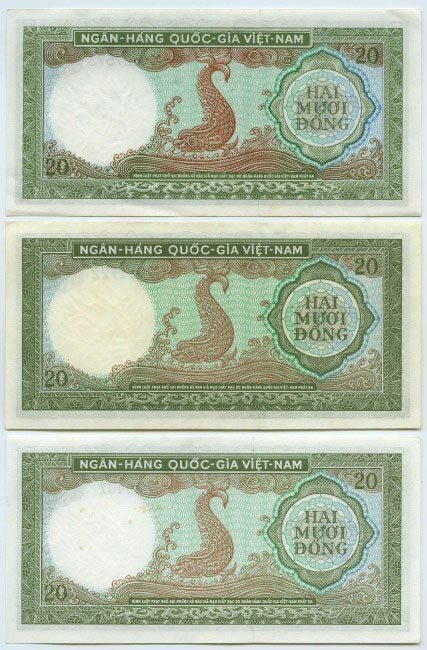 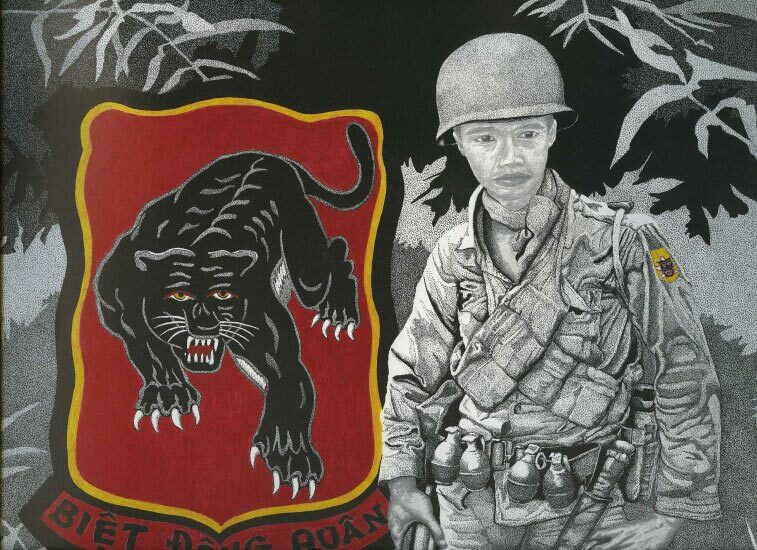 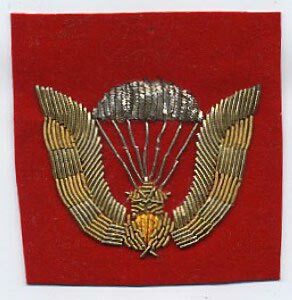 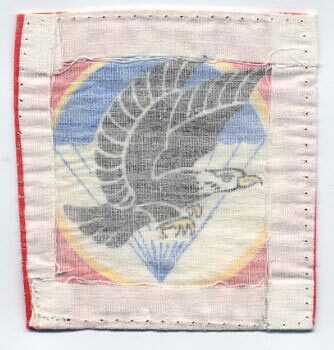 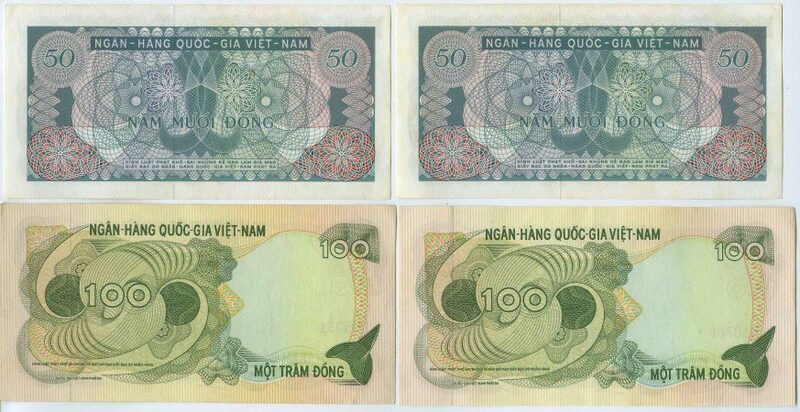 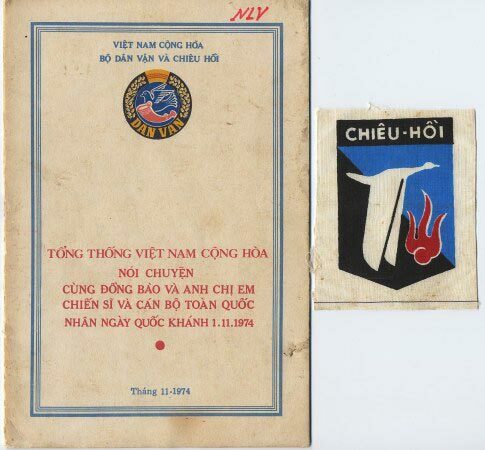 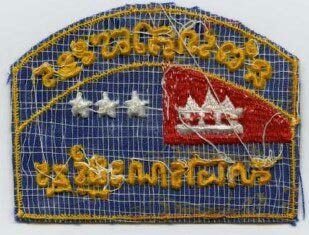 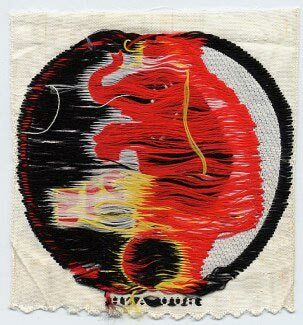 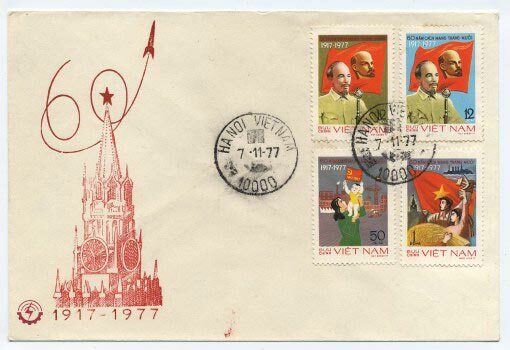 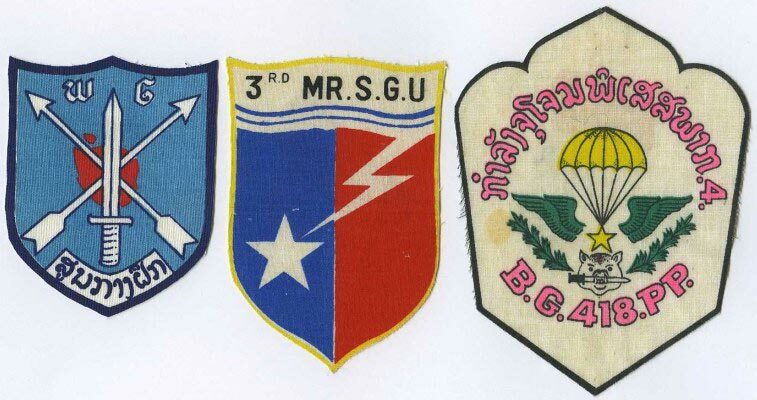 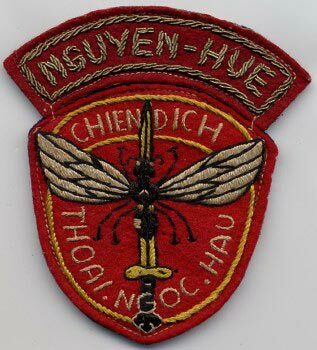 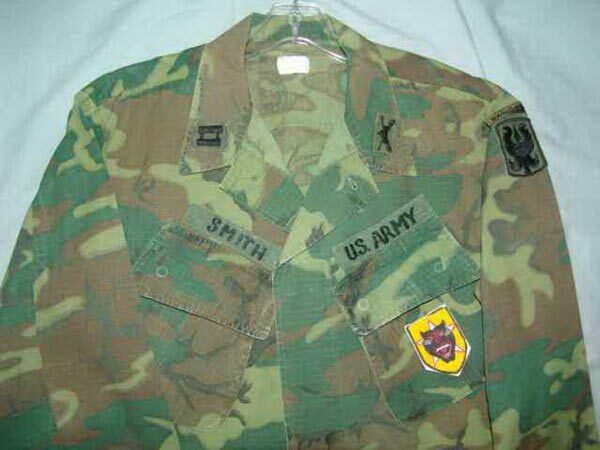 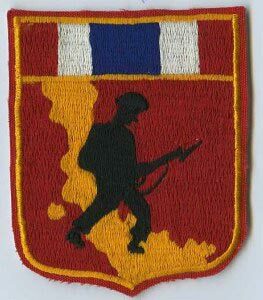 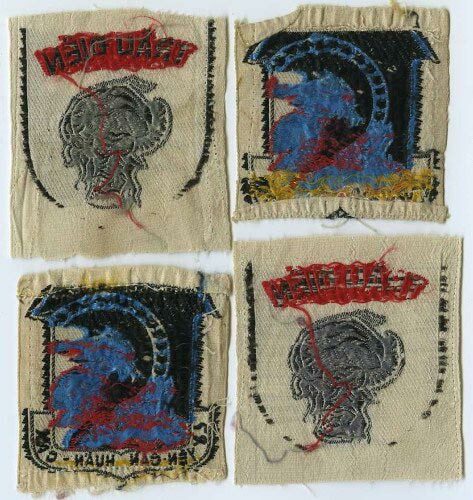 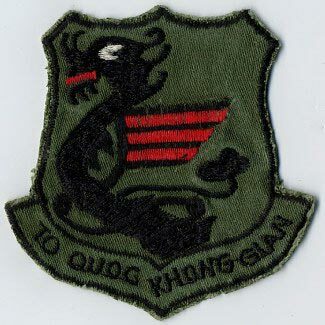 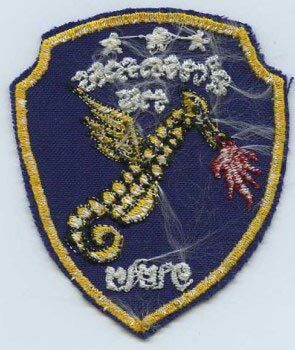 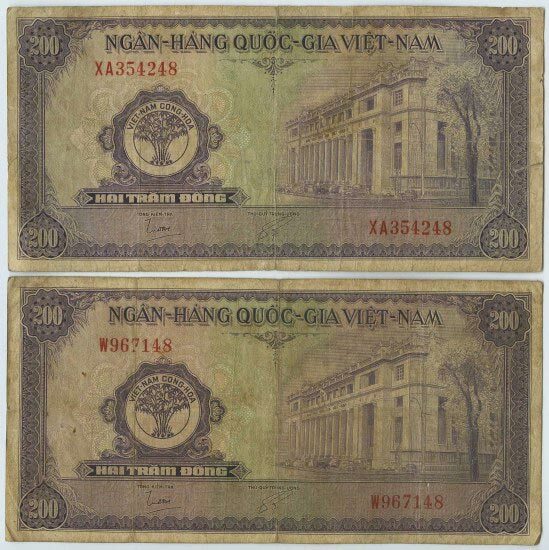 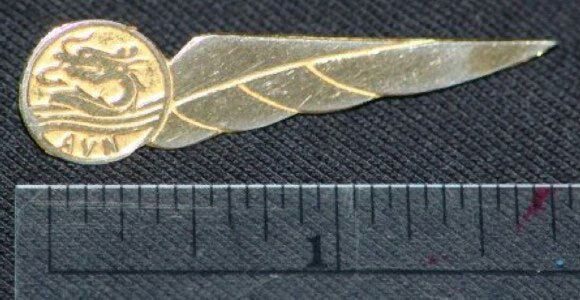 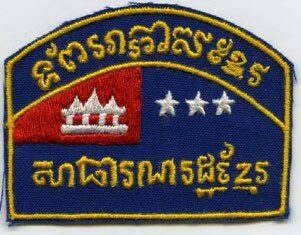 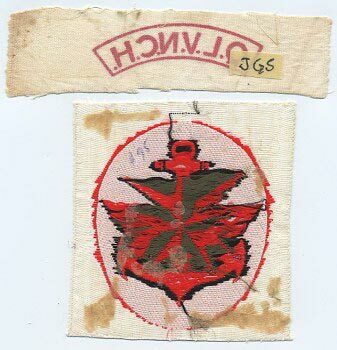 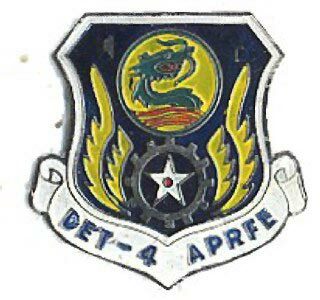 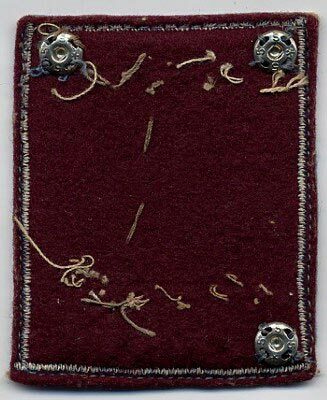 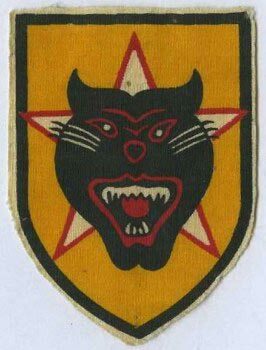 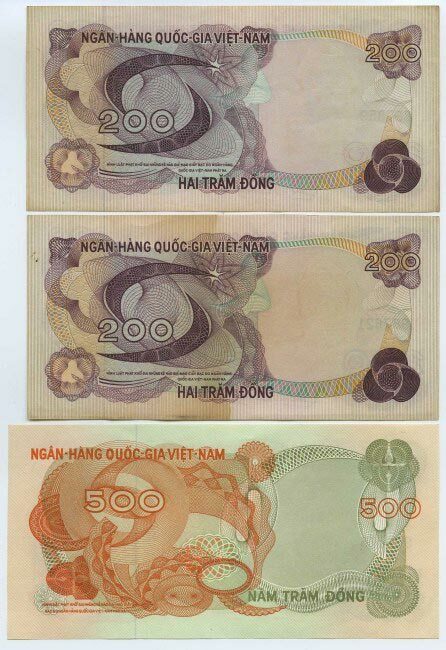 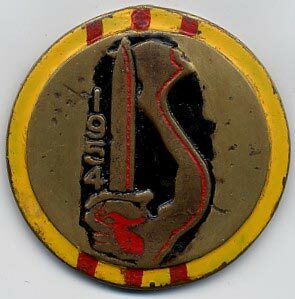 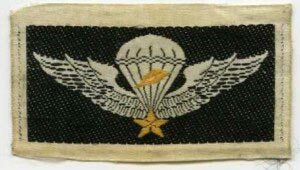 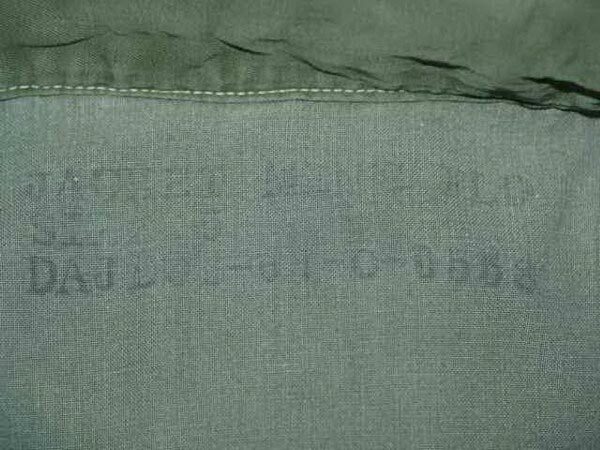 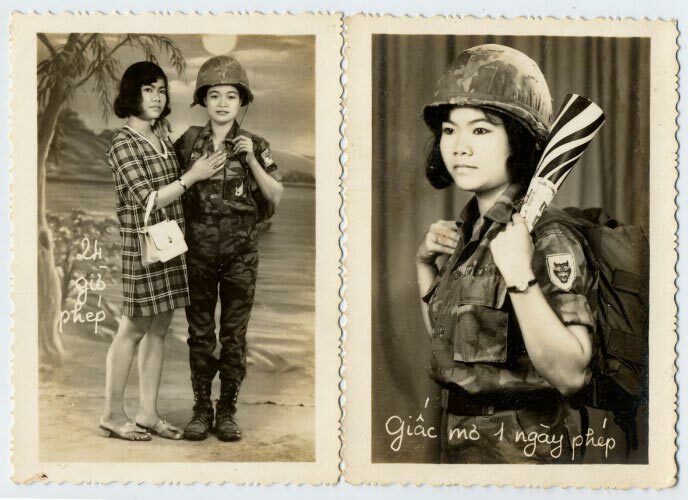 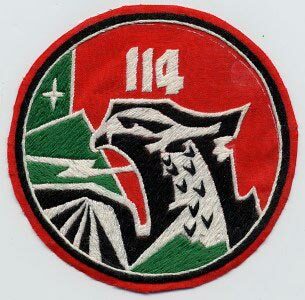 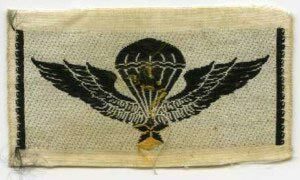 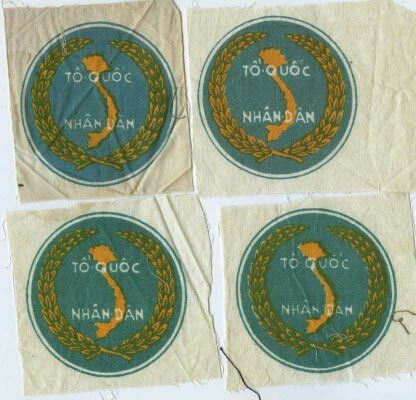 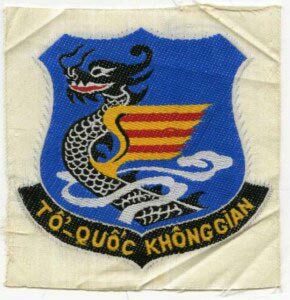 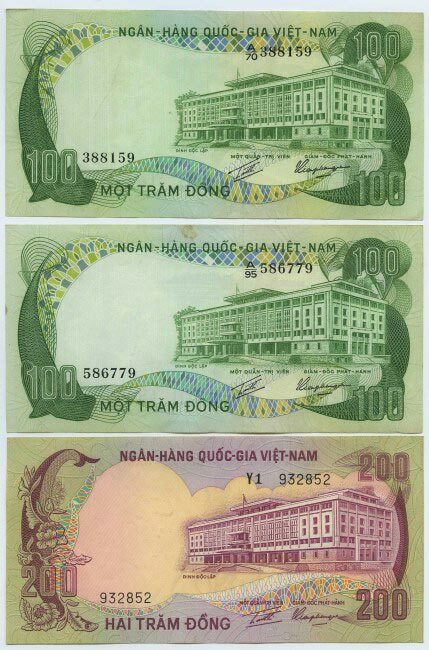 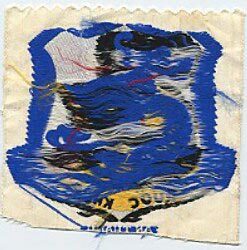 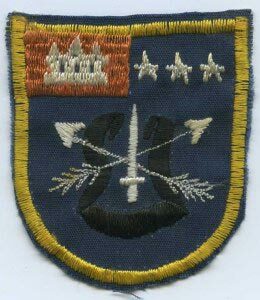 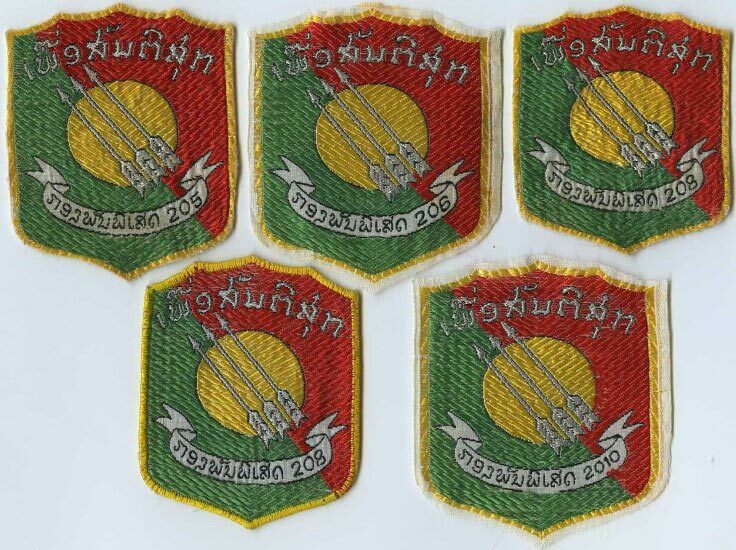 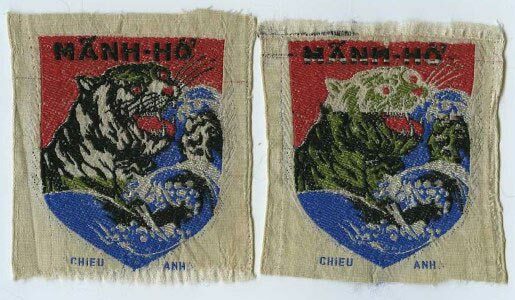 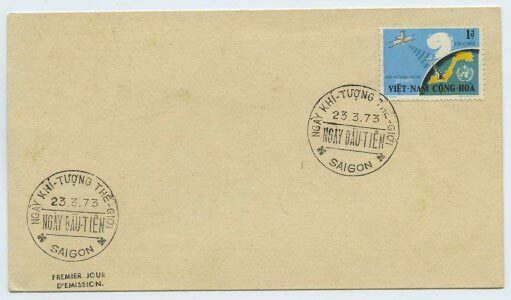 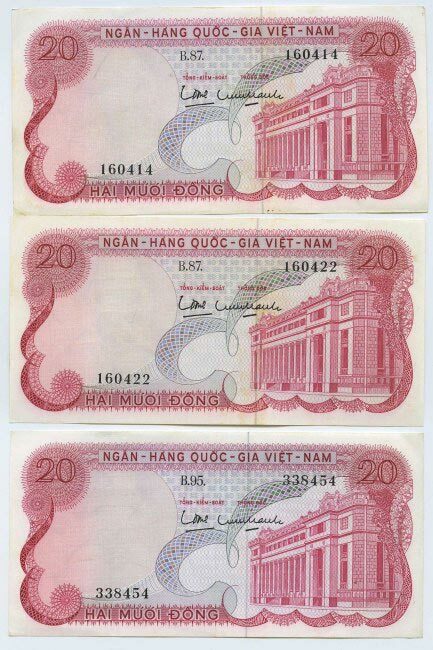 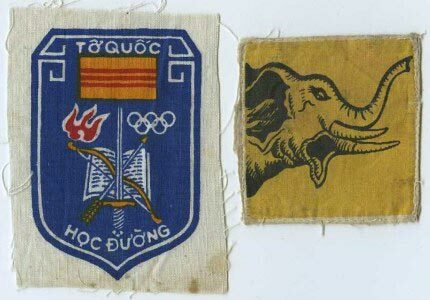 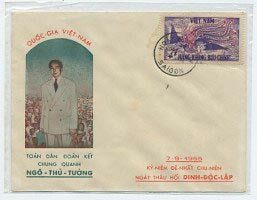 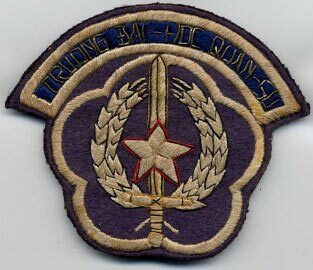 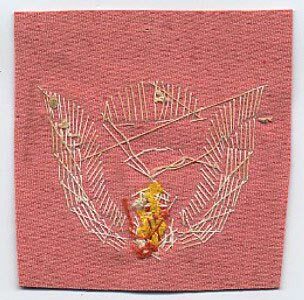 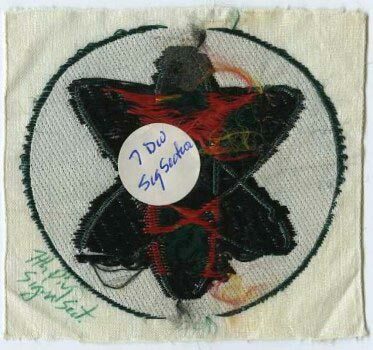 Woven: "VIET-NAM" arc over a VNAF "TO.QUOC KHONG GIAN" shoulder patch (SSI). 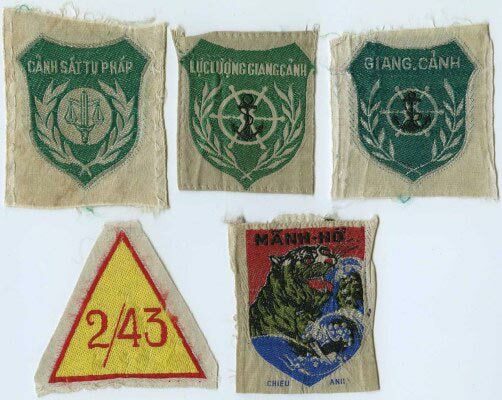 Badges, DIs, ID Cards, Medals, Patches, & etc. 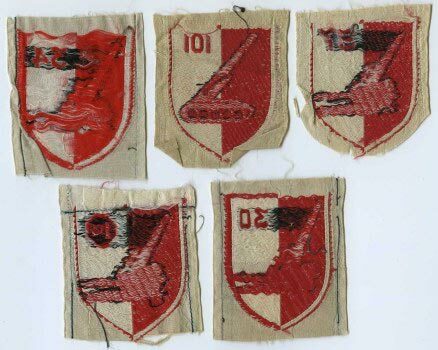 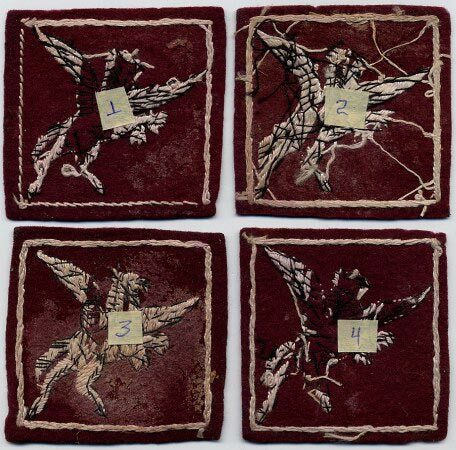 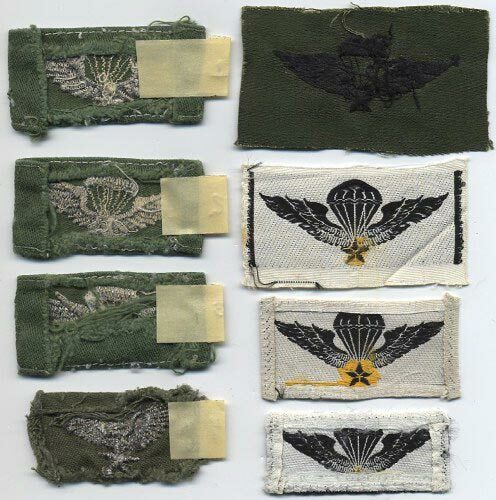 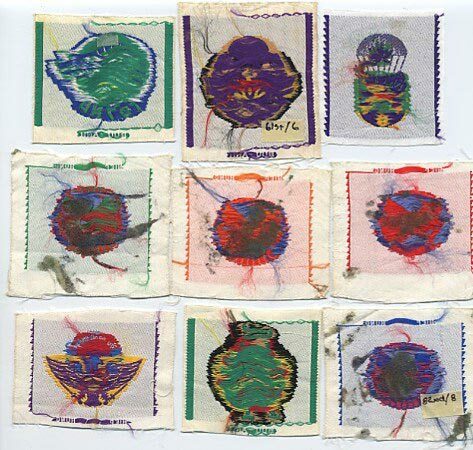 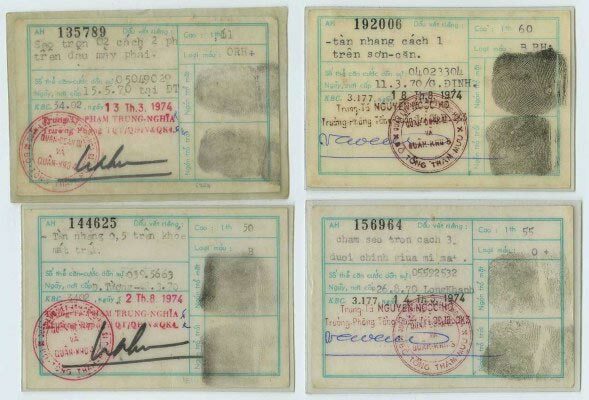 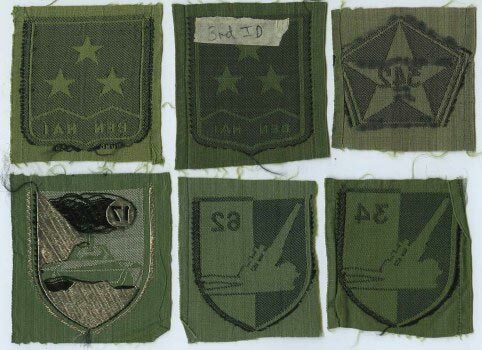 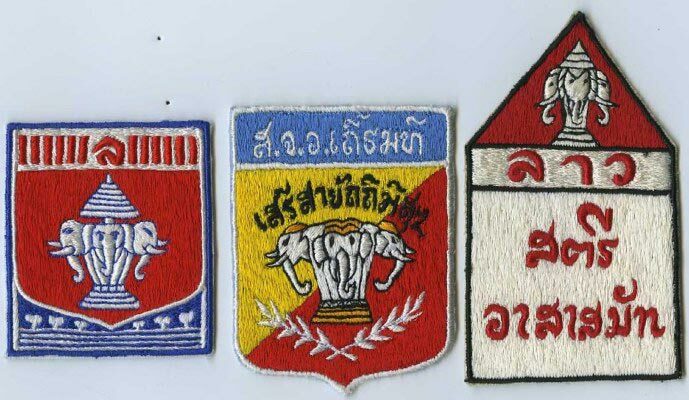 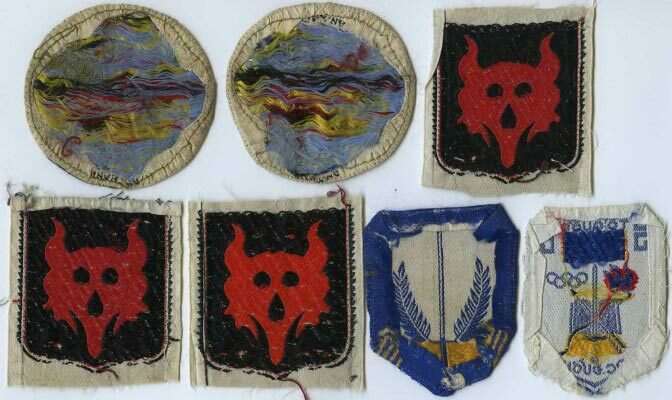 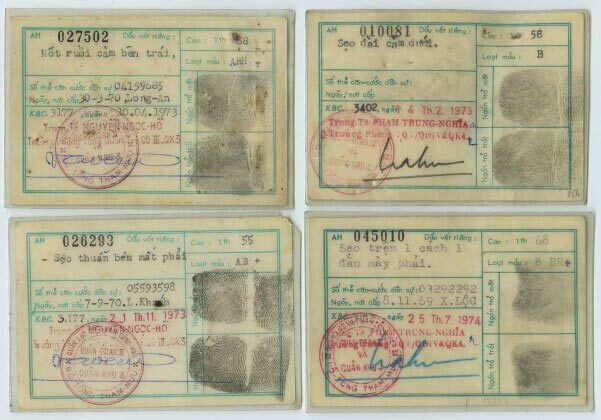 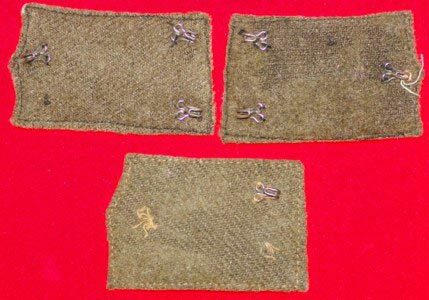 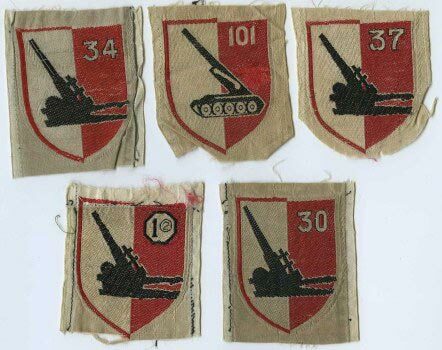 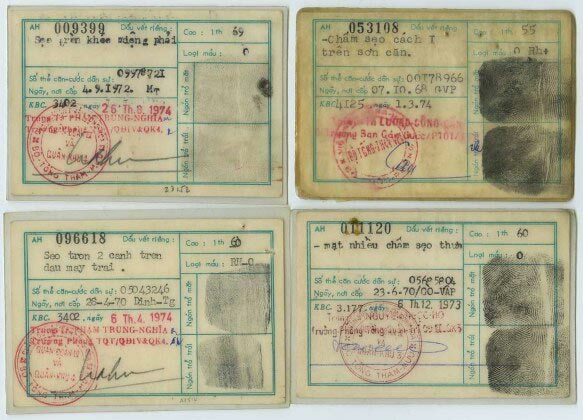 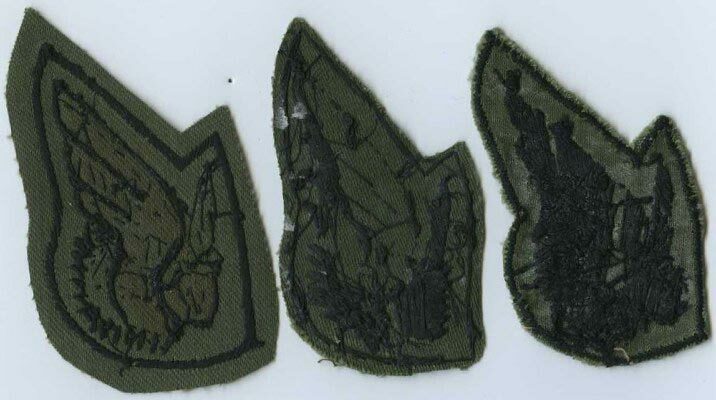 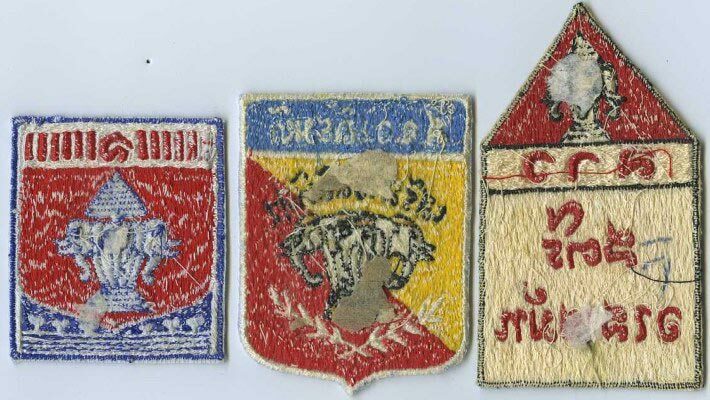 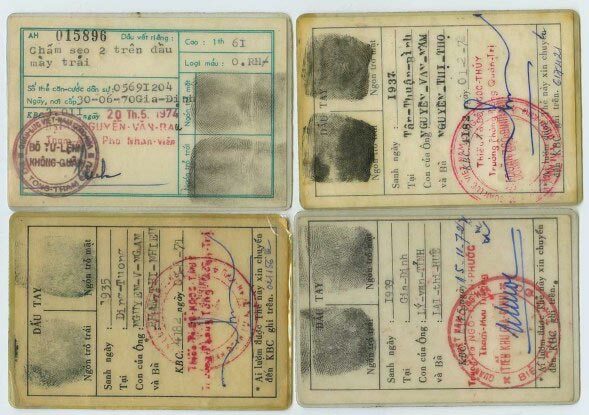 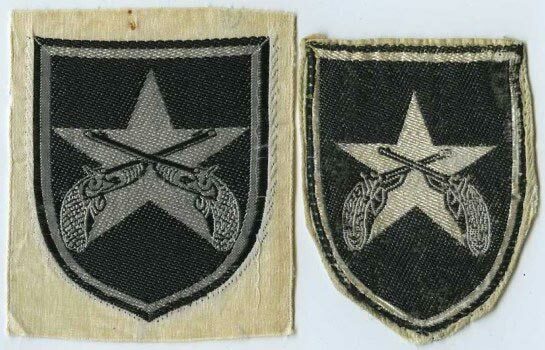 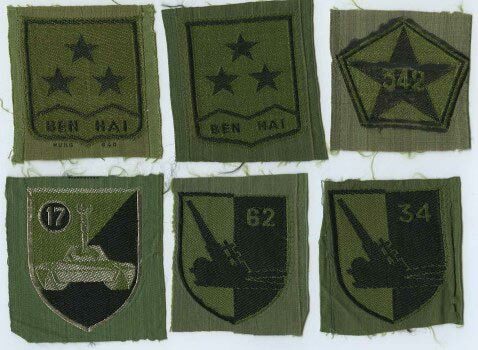 example inquiry: if you want the top-left card....request a price on "Group One, upper-left #505325"
example: "Group Five, upper-right, 301868"
refer to PIC-1 and state which position the patch is in = "PIC-1, Top Center, 101 SP Artillery patch"
"National Police - To Serve the People"
I don't think I have ever met a Vietnamese that believed this motto. 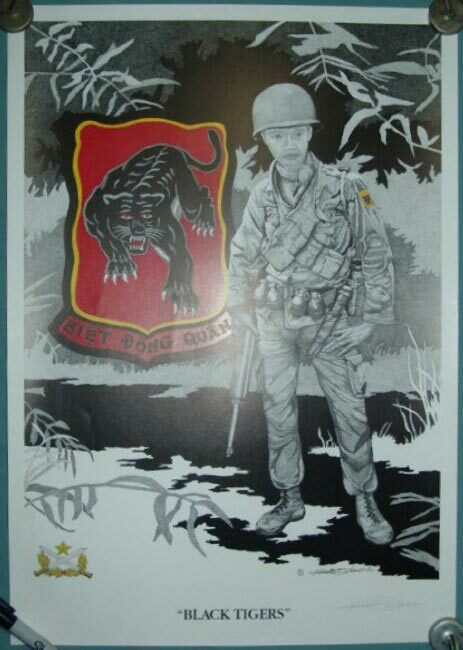 Large "BIET DONG QUAN" print, 14" x 19 1/2"
Anyone know the name of this Artist? 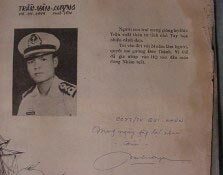 I cannot read his signature. 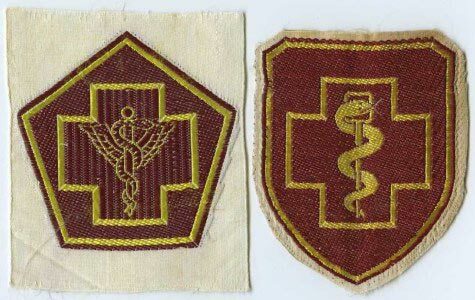 anyone know which school wore these? 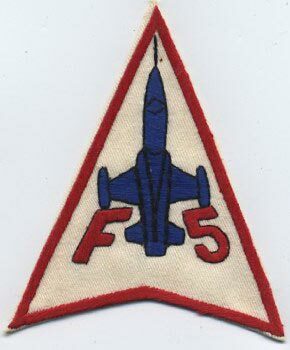 Later know as the Popular Forces(PF), the boys at the bottom of the Totem Pole for everything. 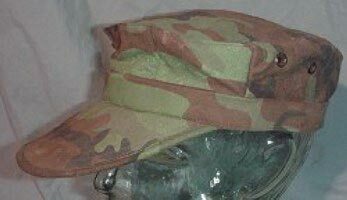 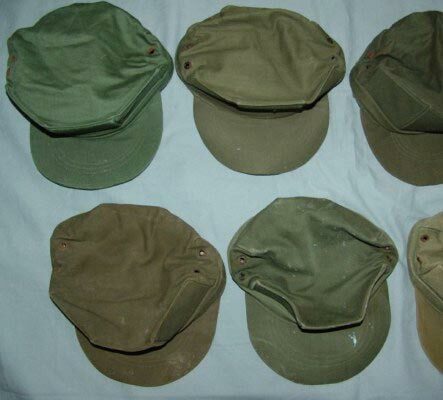 Many of them never had boots/hats/etc. 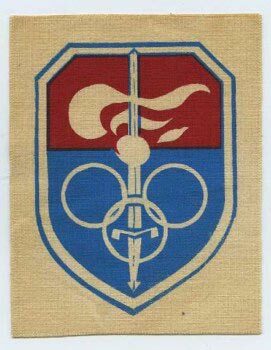 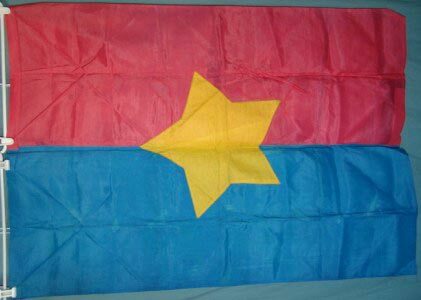 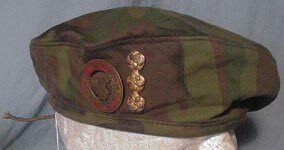 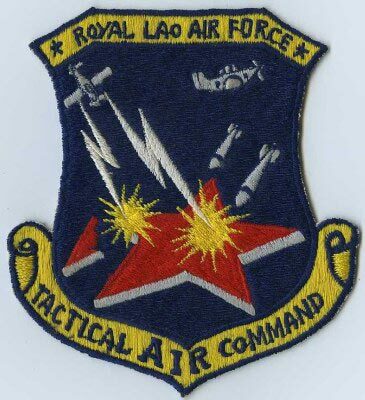 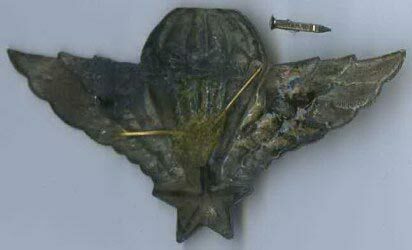 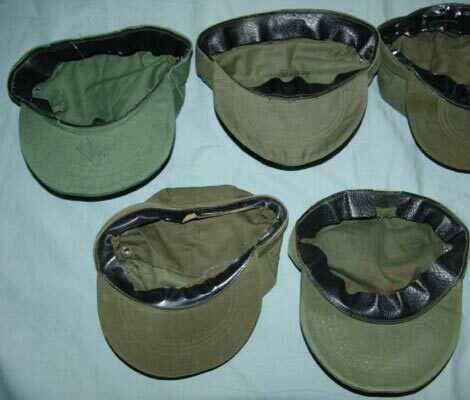 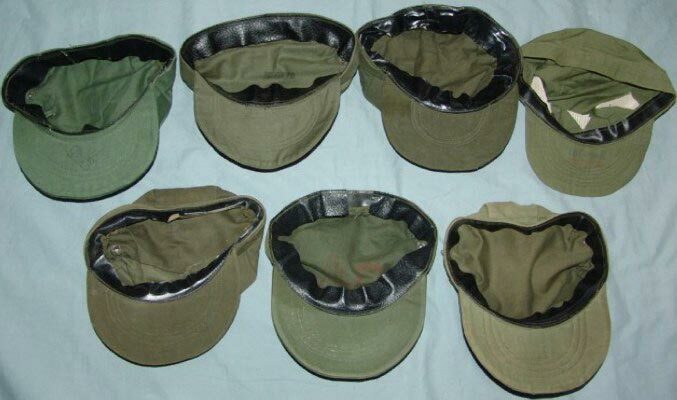 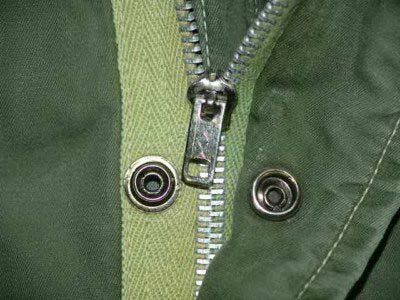 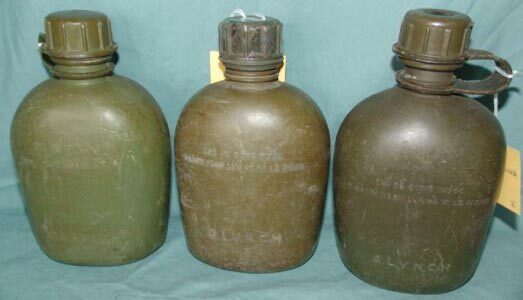 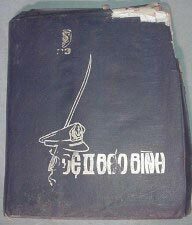 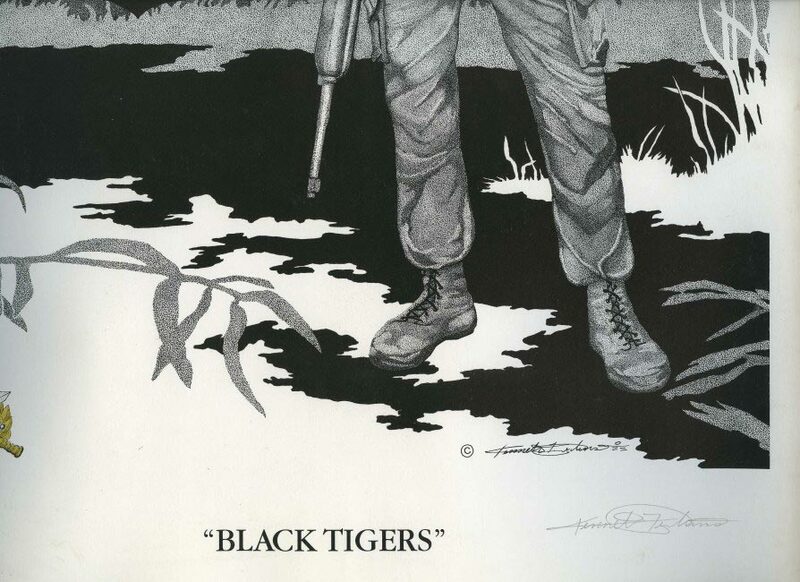 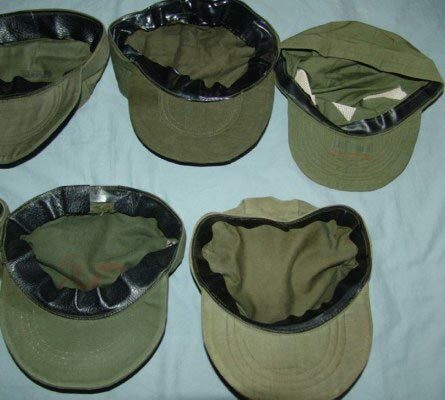 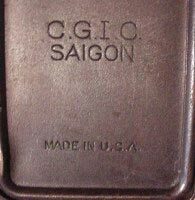 and were left holding the "bag" when the main-force ARVN/VNMC headed south. 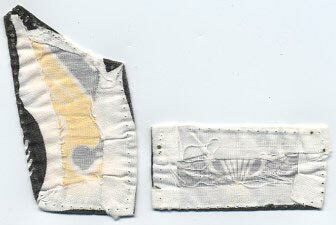 Left picture - "24 Hours of Rest!" 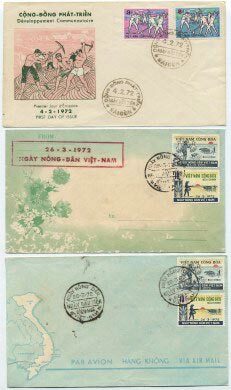 Right picture - "Enjoying one day's Rest"
These pictures are not for sale - thought you might like to look! 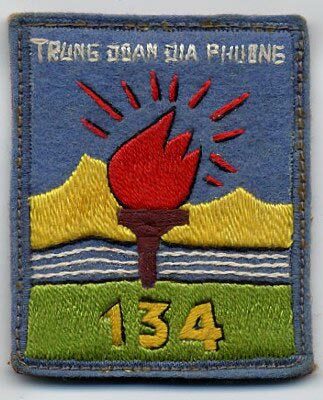 UI #147 - any idea what this was for? 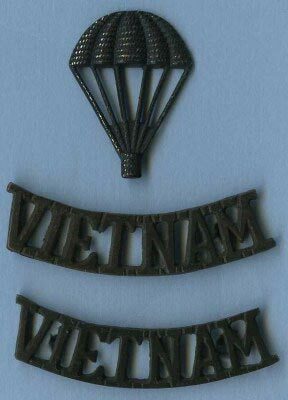 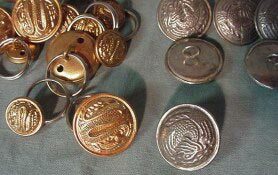 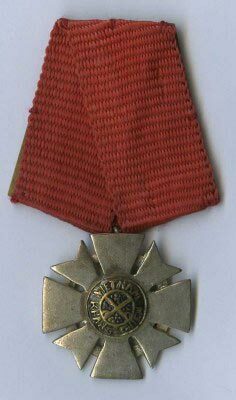 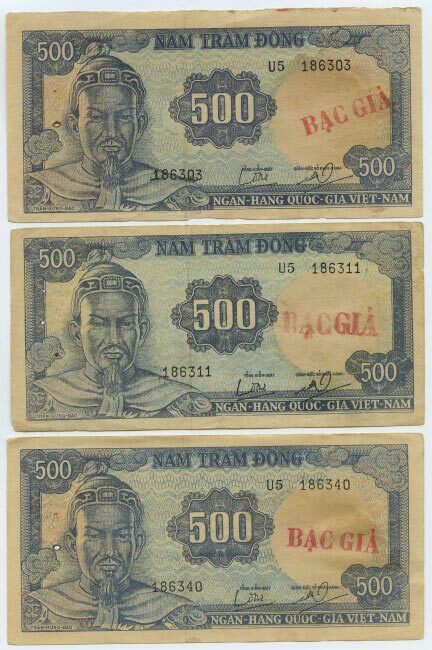 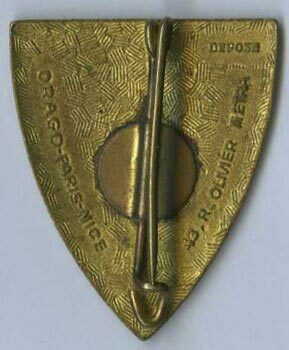 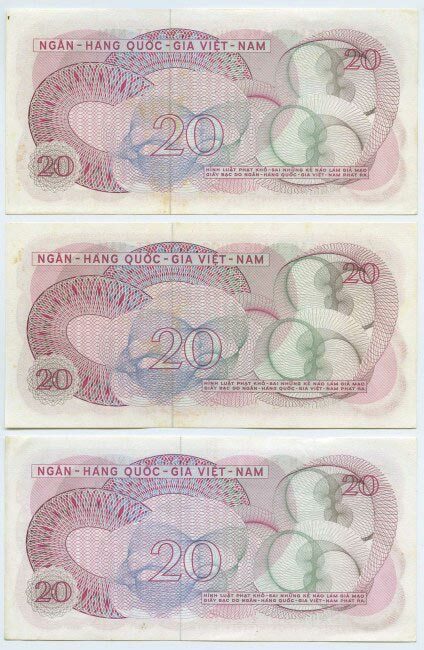 UI#219 - "VIETNAM" arcs (2" wide) are crudely cast in brass, parachute is stamped(well made), possibly made in Vietnam, European style loops on reverse. 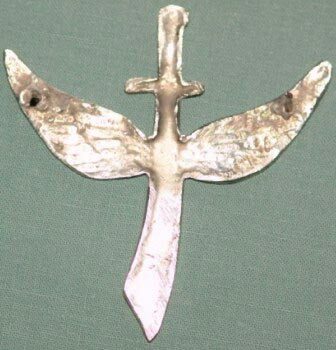 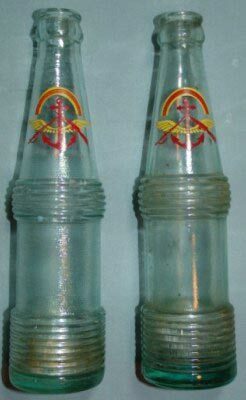 No markings, any ideas? 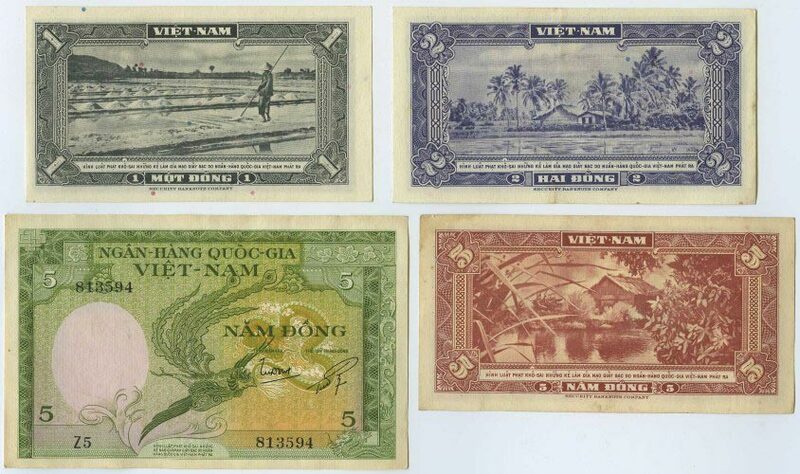 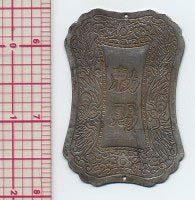 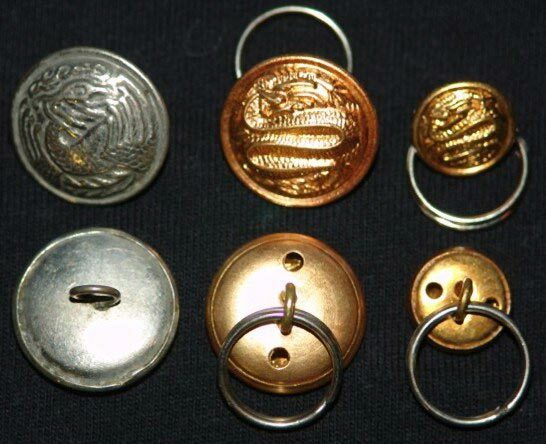 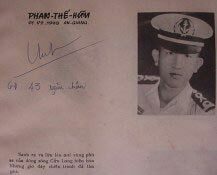 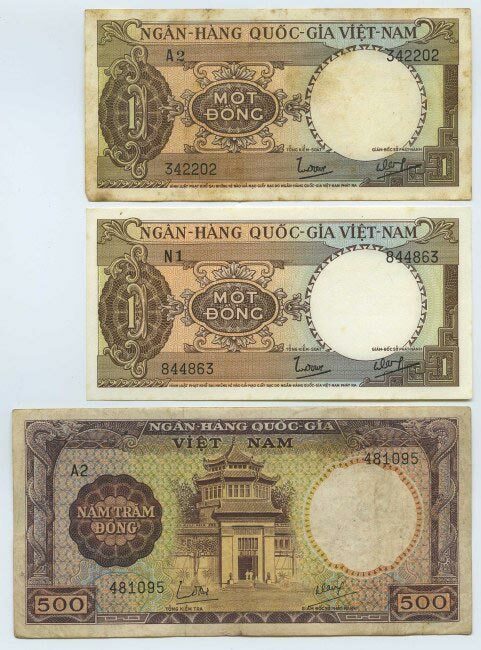 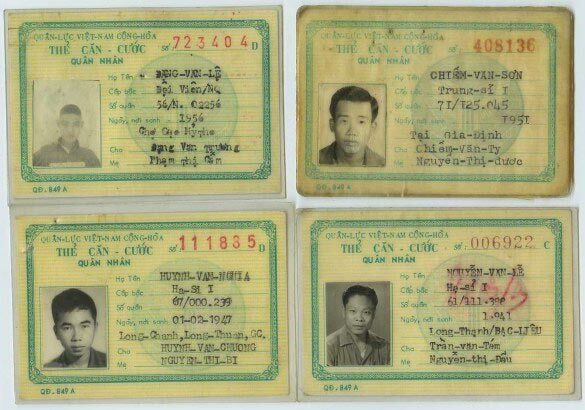 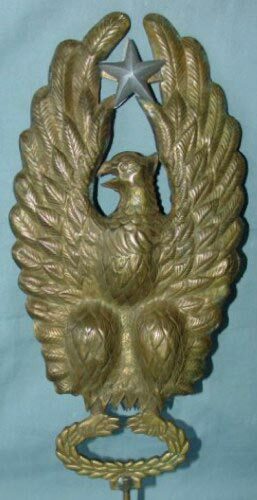 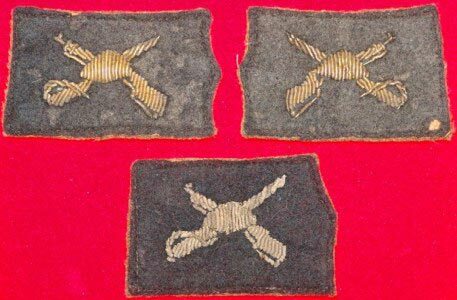 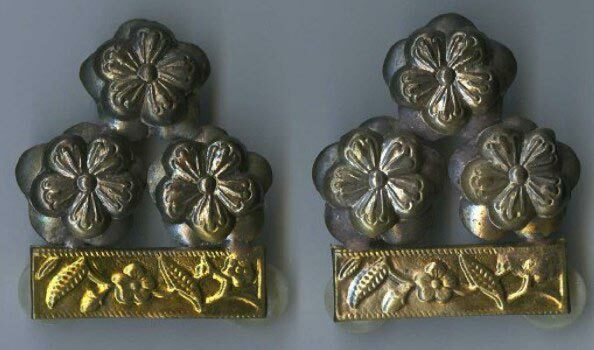 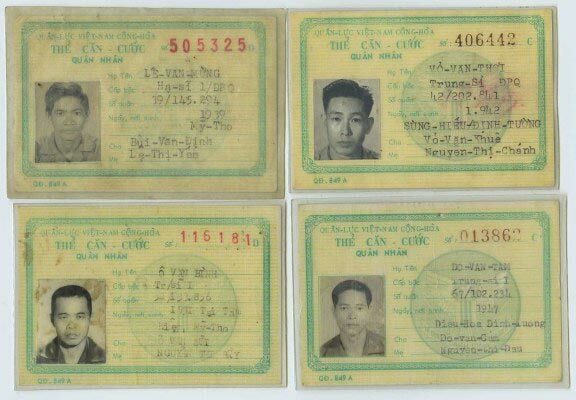 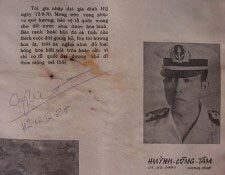 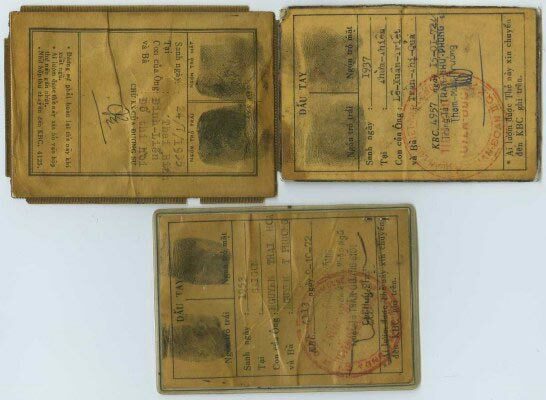 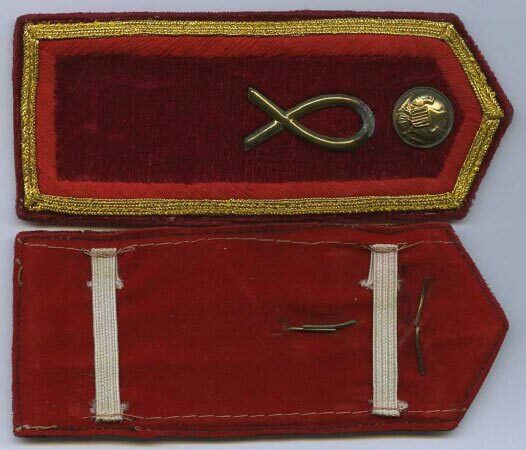 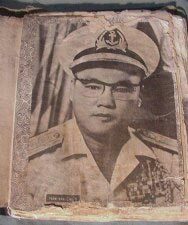 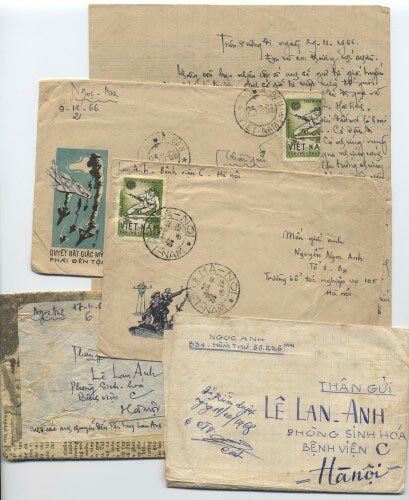 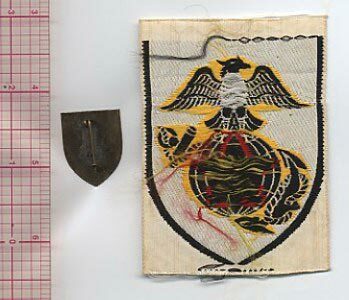 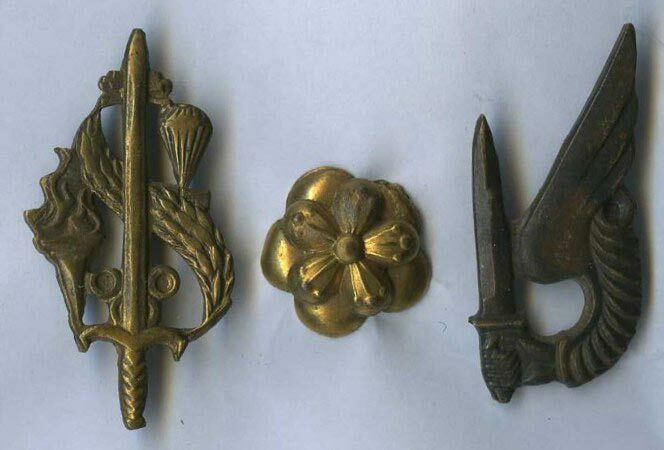 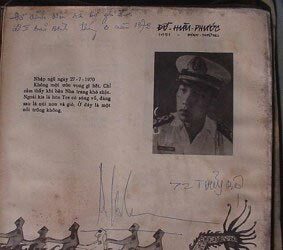 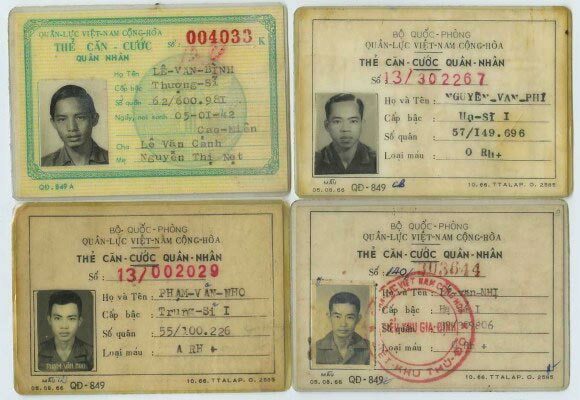 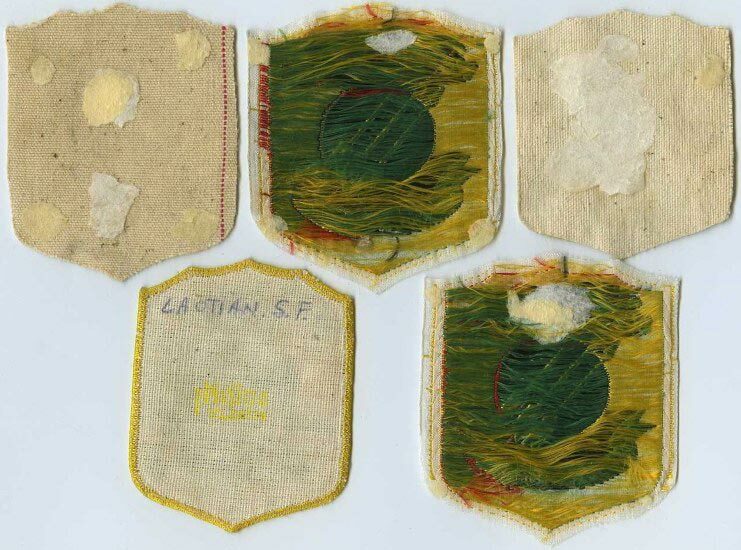 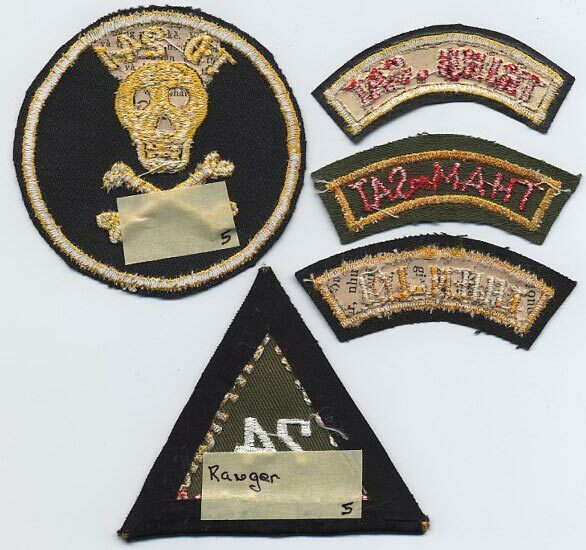 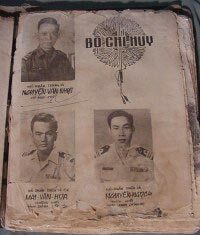 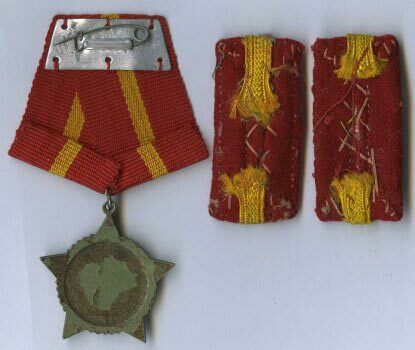 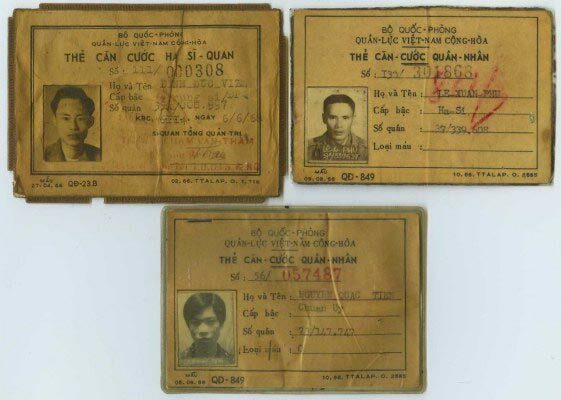 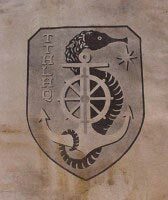 One young Officer, Ly Van Nam, was going to the "7th Fleet"
Clothing, Equipment, Plaques, & etc. 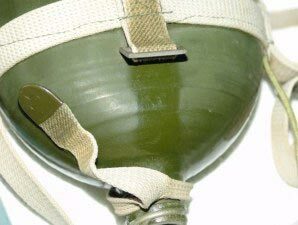 don't ask any Guru level questions! 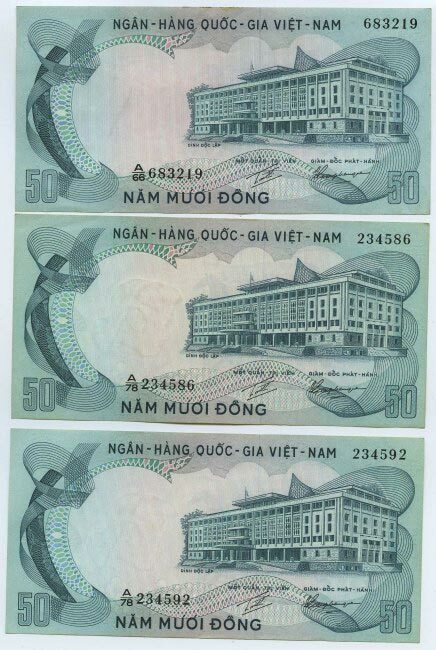 All Notes have been scanned at 300dpi so you can see the: Good, Bad, and Ugly = eschew obfuscation. 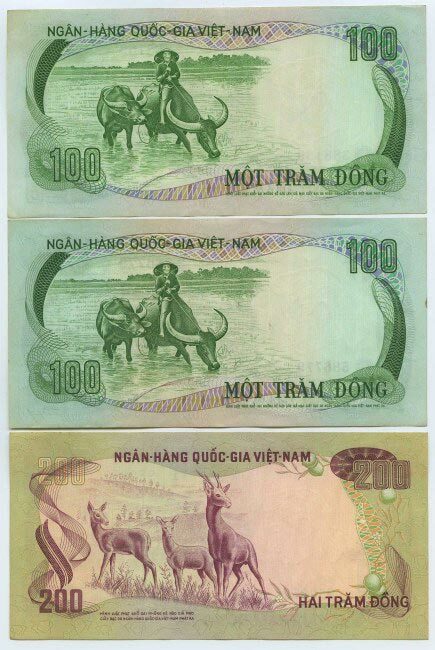 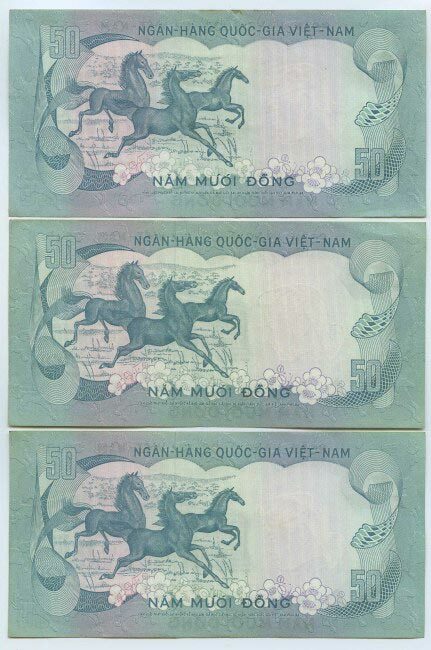 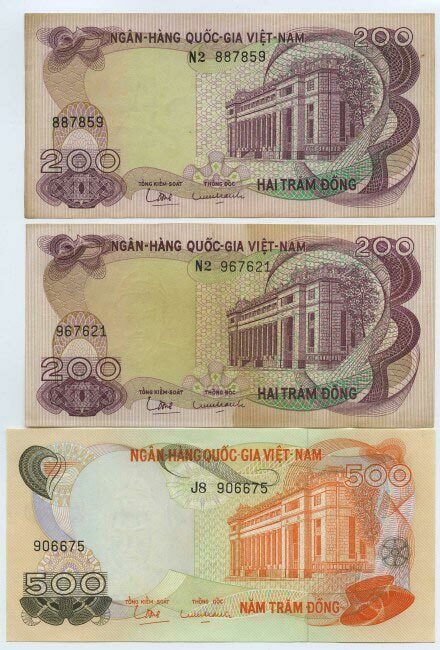 All Notes have been scanned at 300dpi so you can see the: Good, Bad, and Ugly. 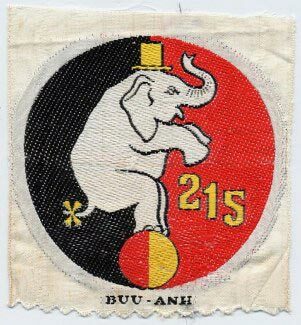 UI#244. 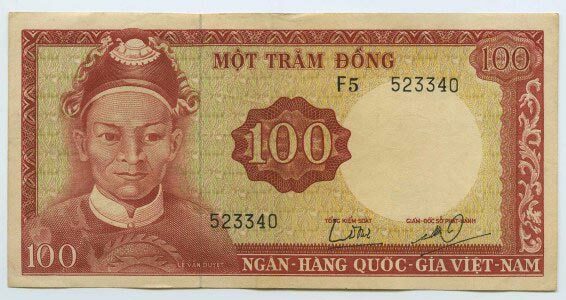 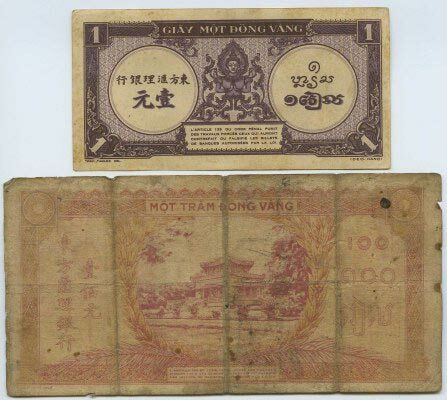 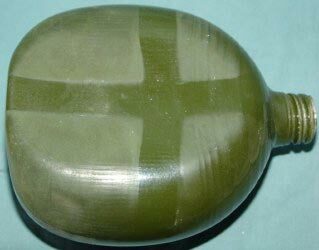 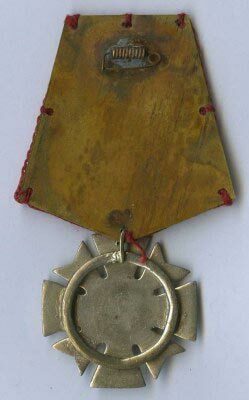 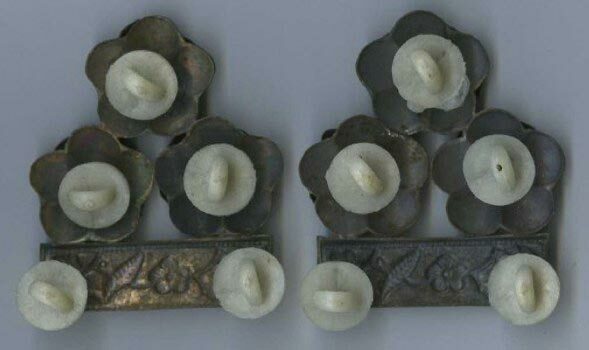 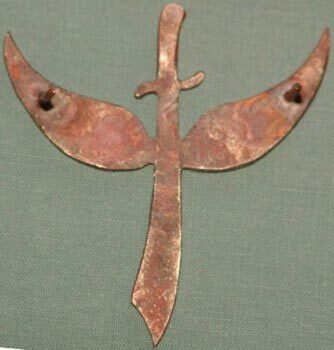 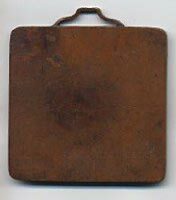 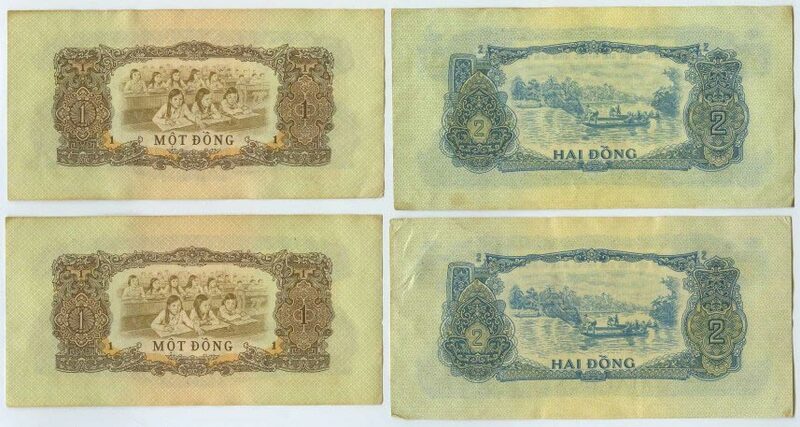 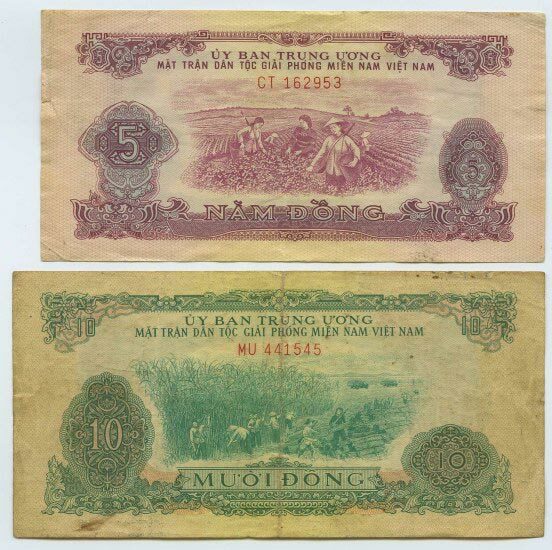 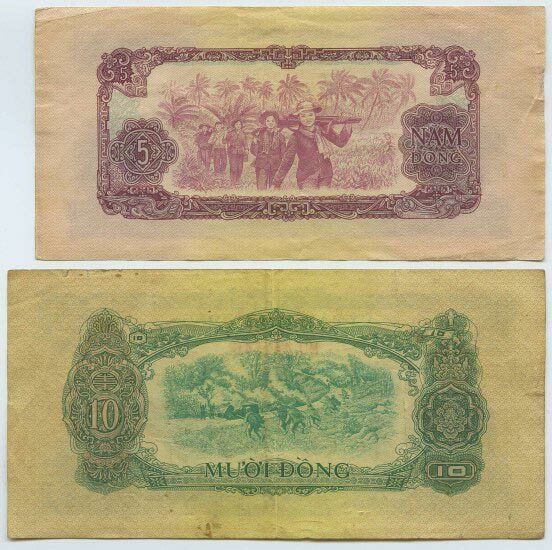 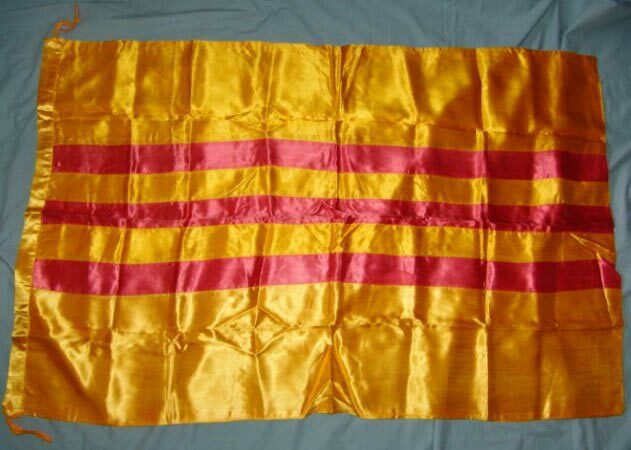 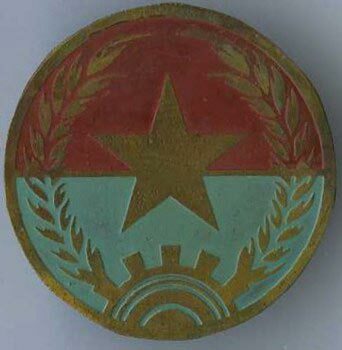 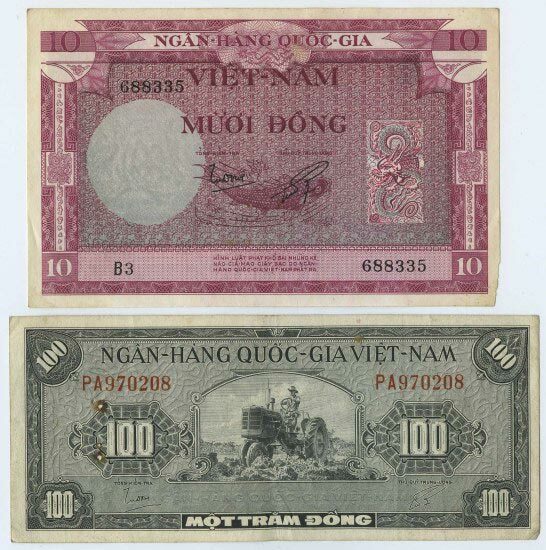 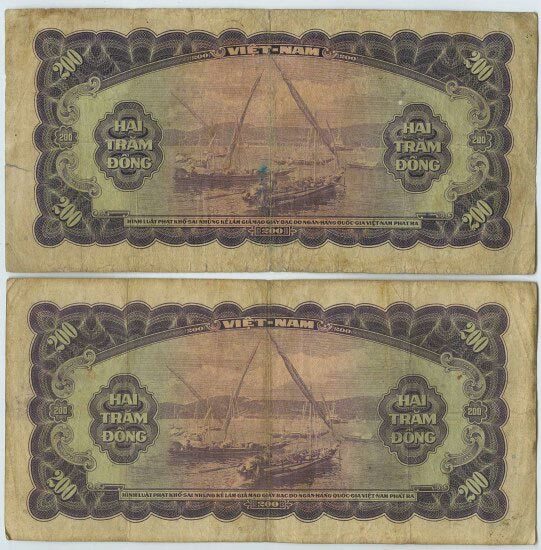 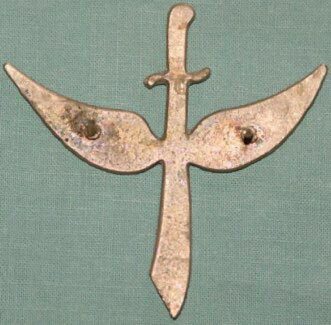 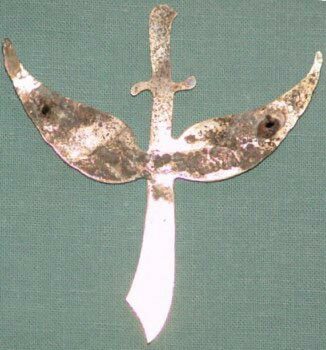 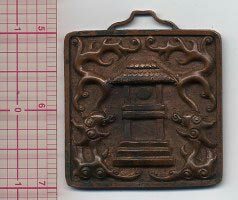 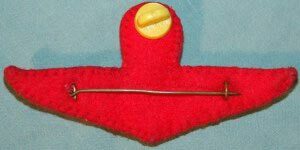 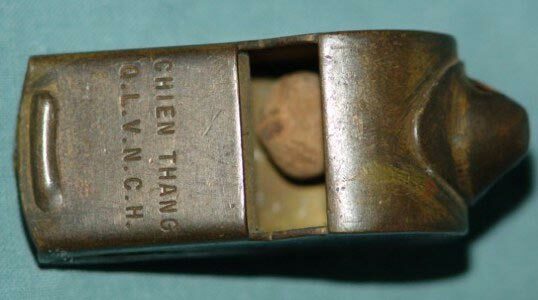 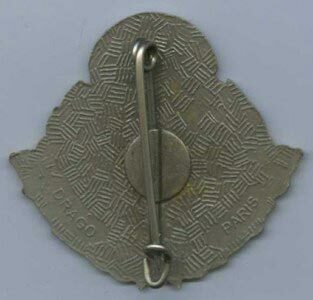 "VIETNAM KHANG CHIEN", any idea what this is for or who used it? 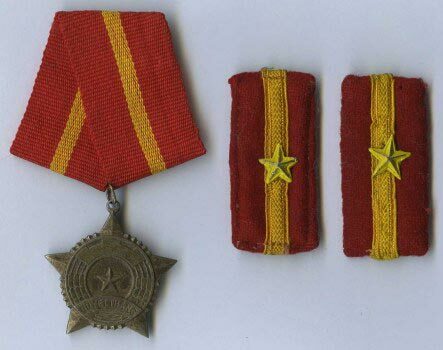 Soviet style backing behind the ribbon, heavy construction, not typical of Commie workmanship? 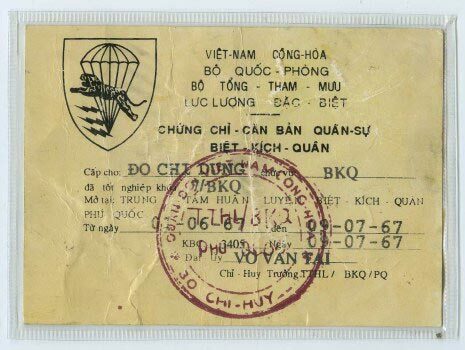 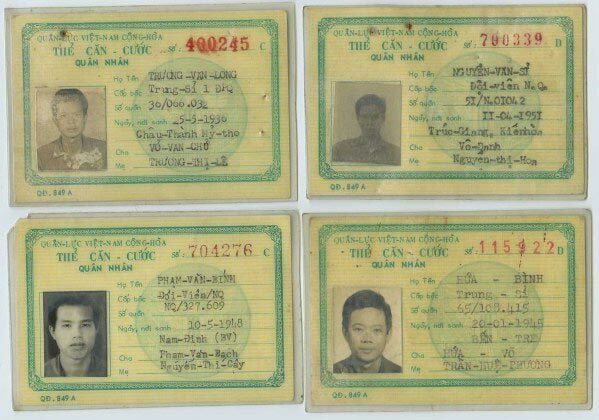 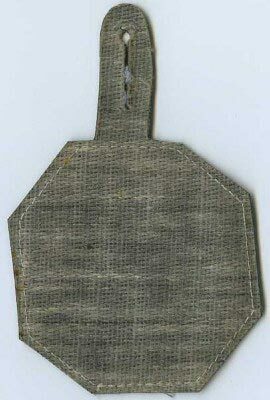 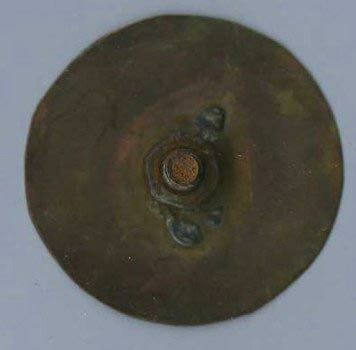 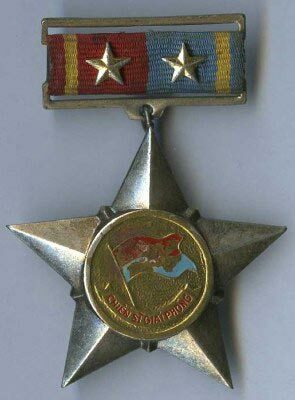 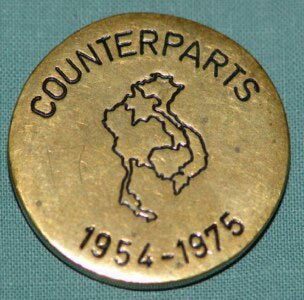 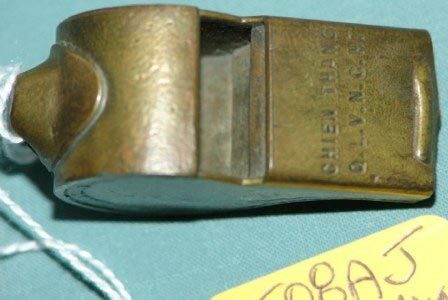 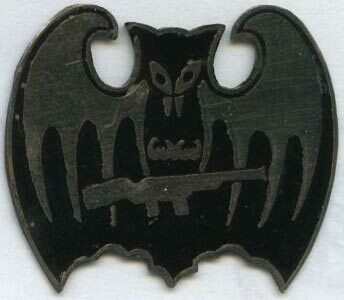 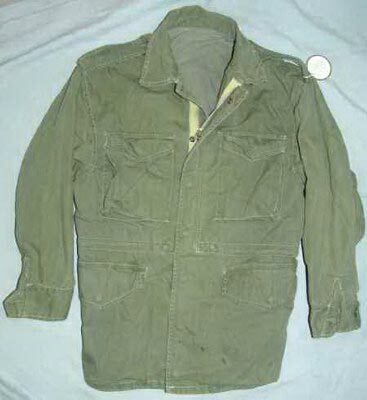 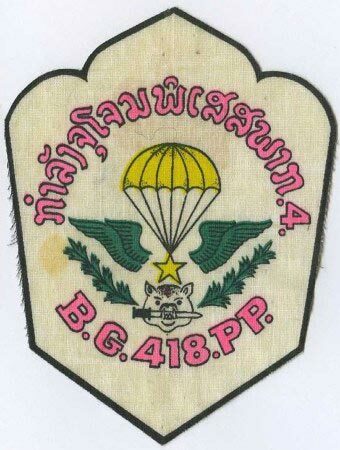 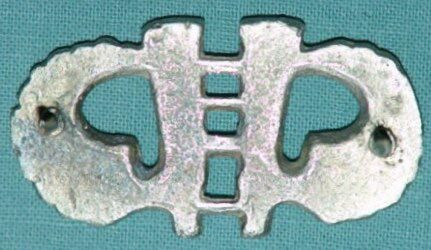 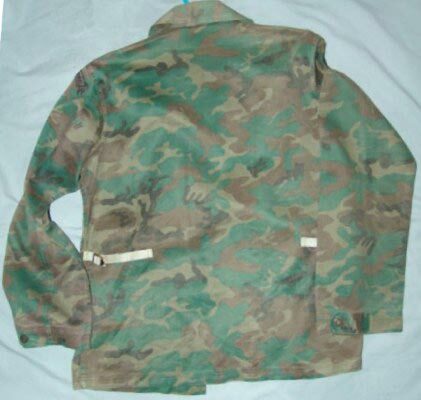 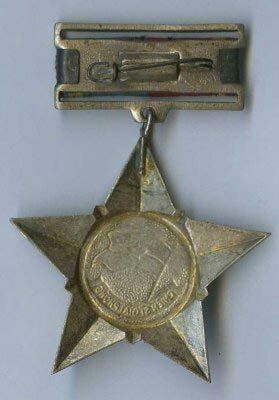 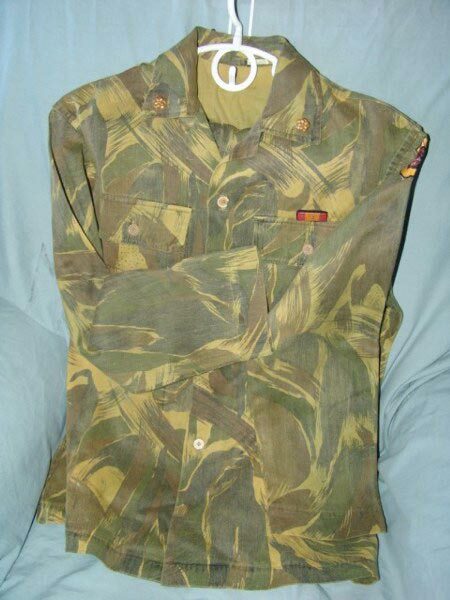 4563B - early CHICOM NVA "split-yoke Harness"
National Liberation Front (NLF), circa 1963 to ? 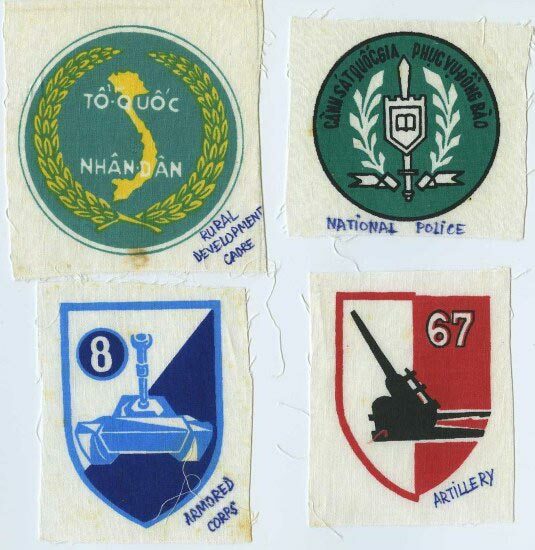 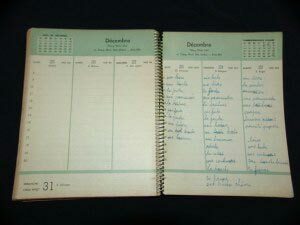 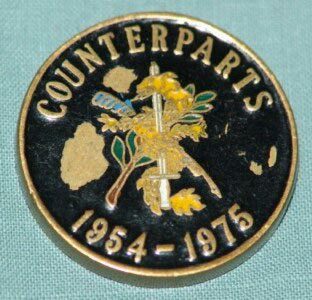 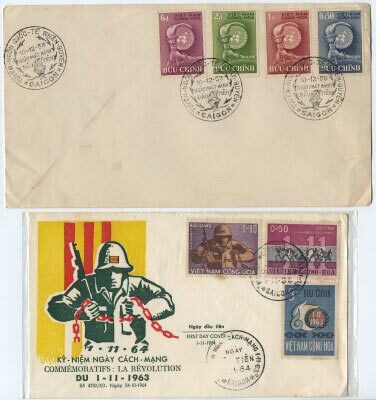 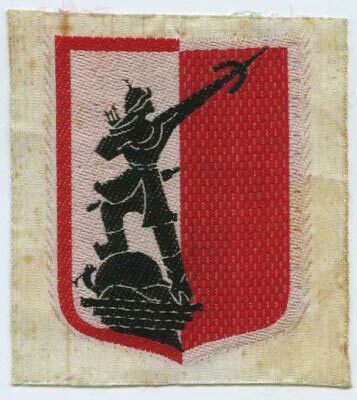 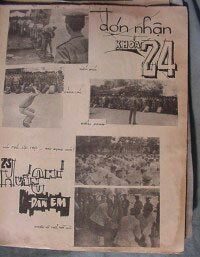 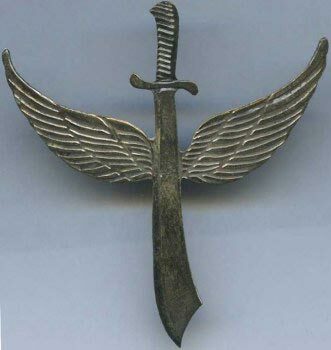 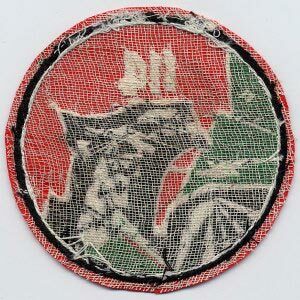 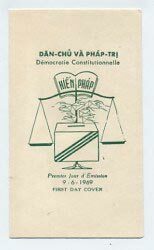 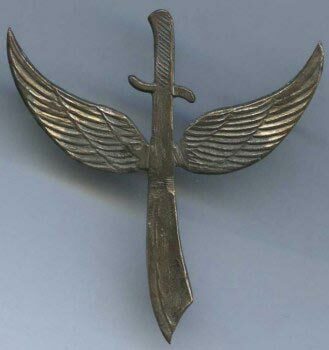 National Liberation Front, circa 1963 to ? 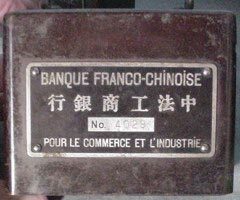 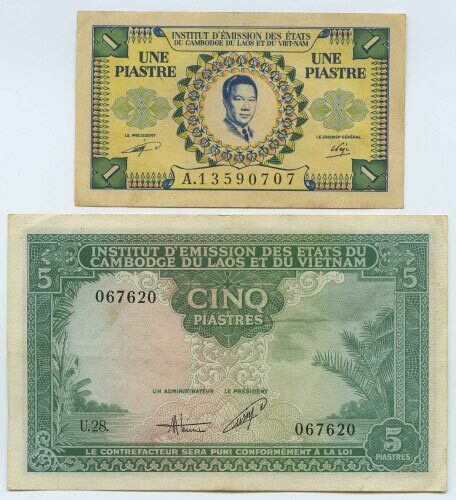 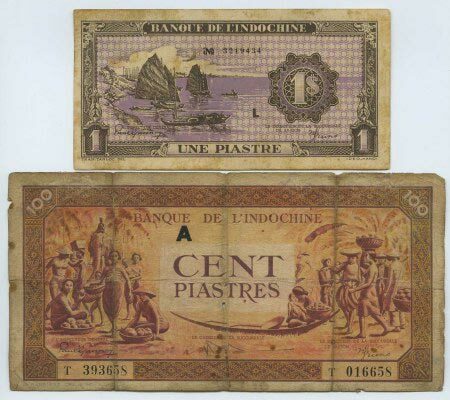 "BANQUE FRANCO-CHINOISE POUR LE COMMERCE ET L'INDUSTRIE"
"gamlang seua pa pak 3"
Anyone know any info on this unit? 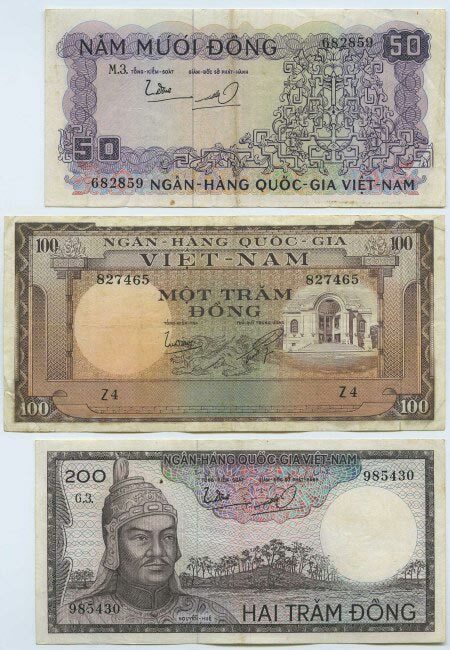 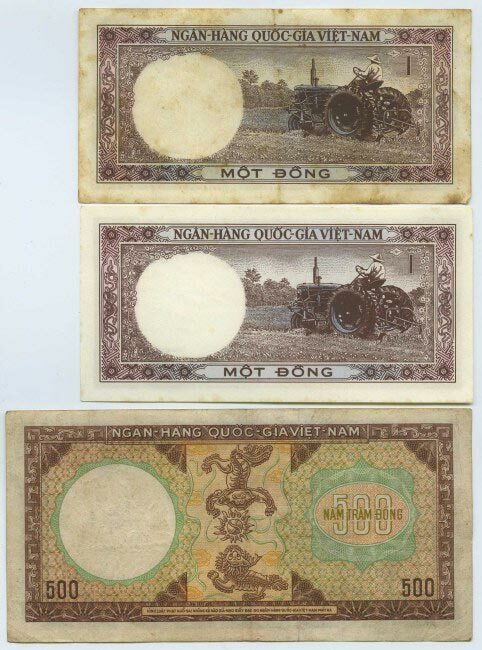 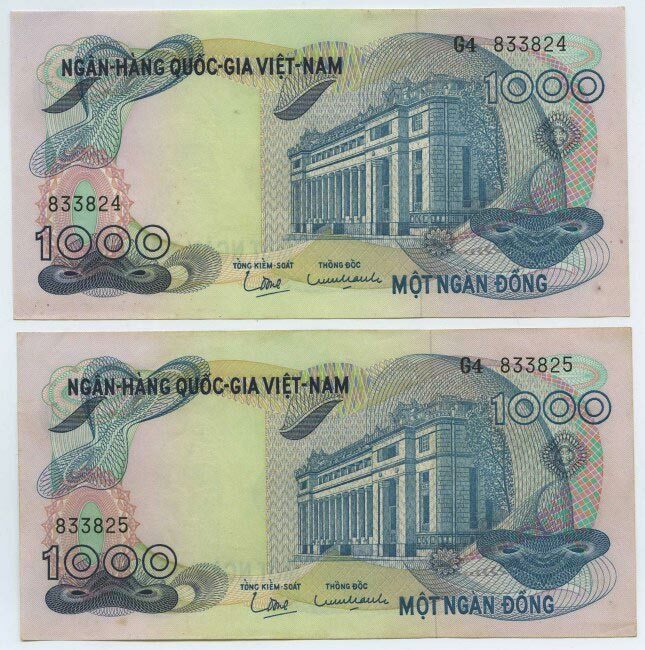 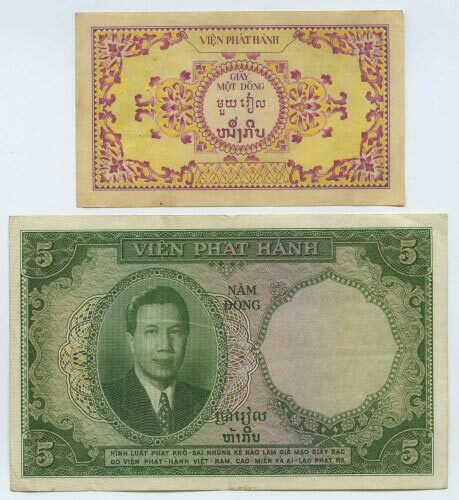 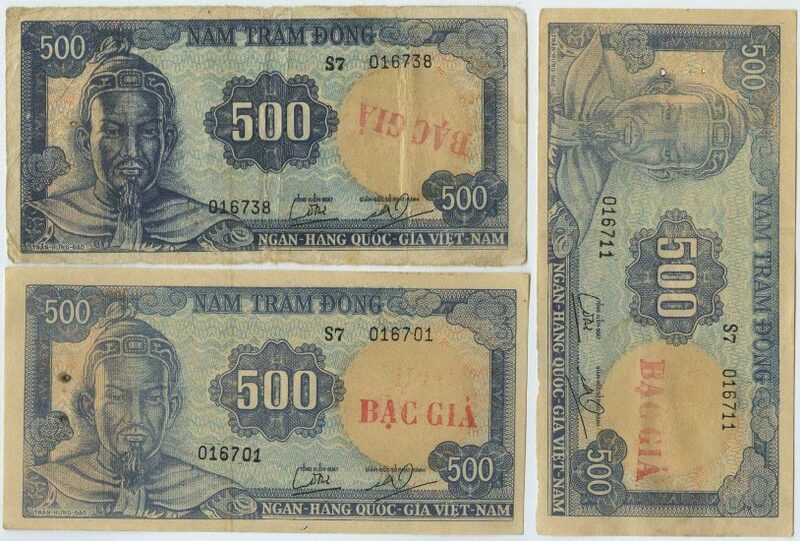 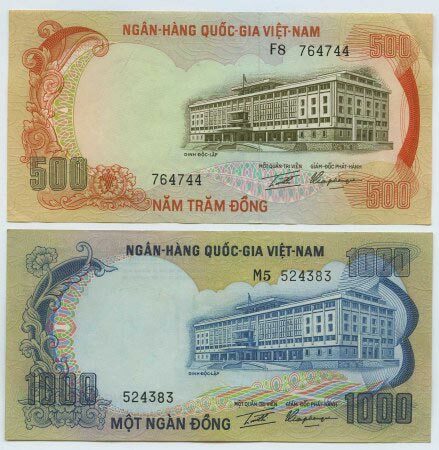 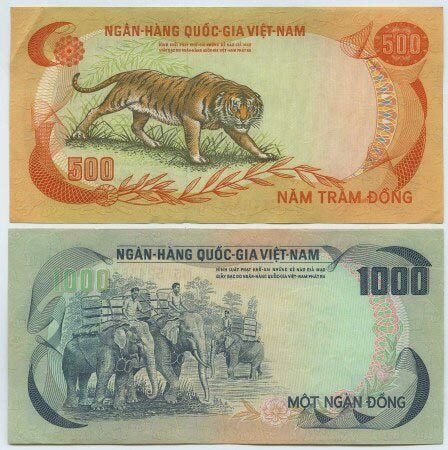 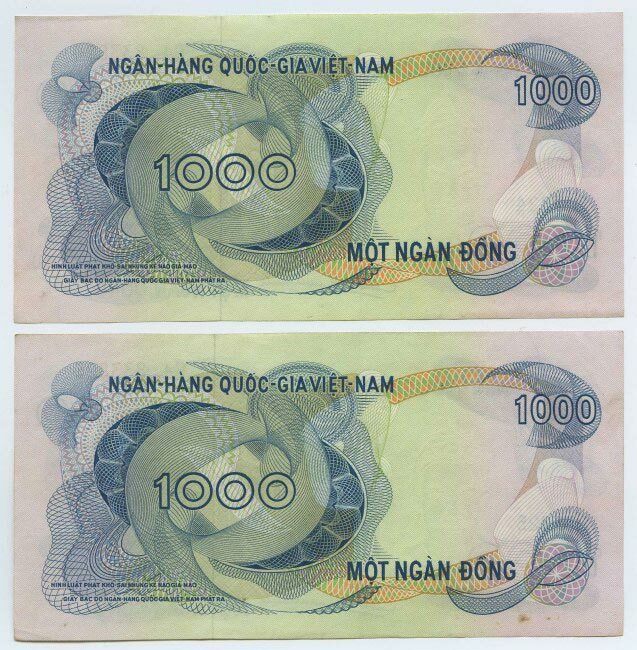 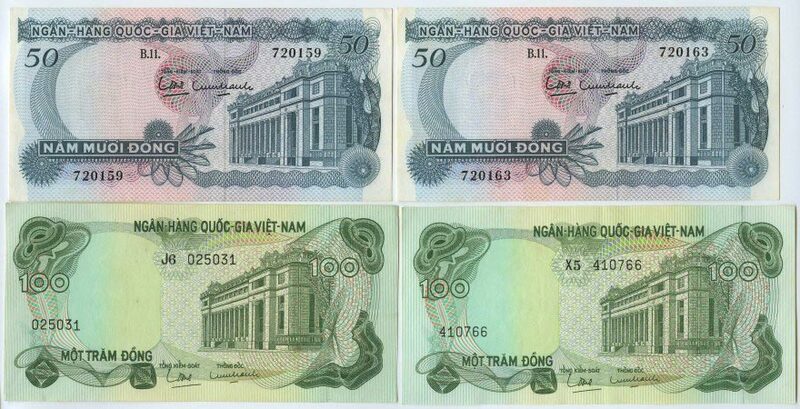 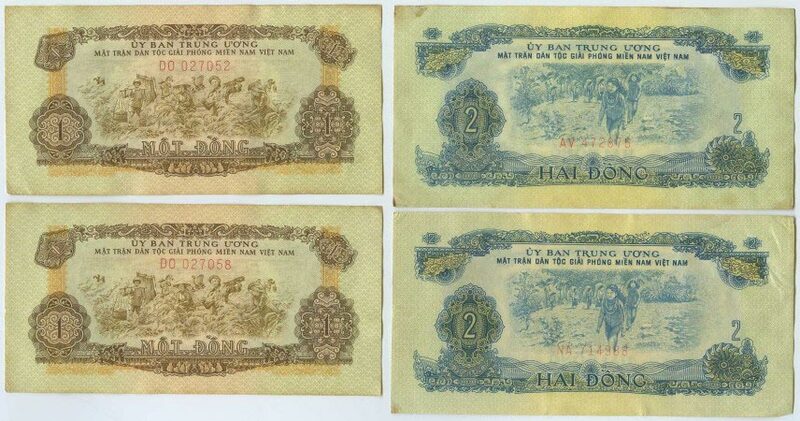 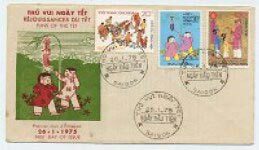 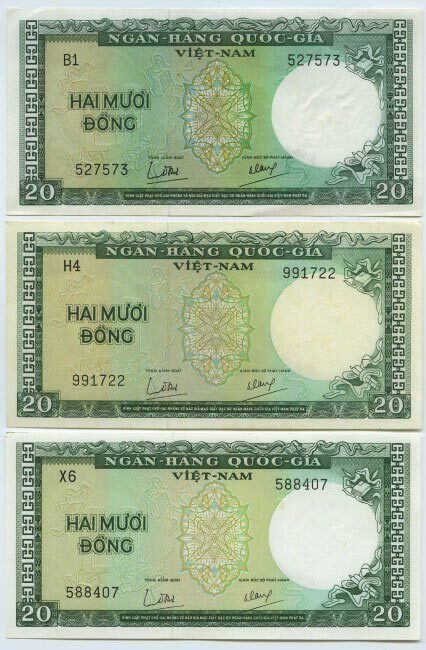 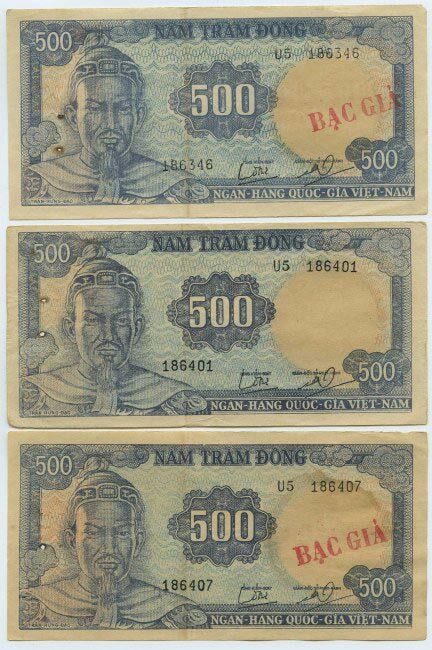 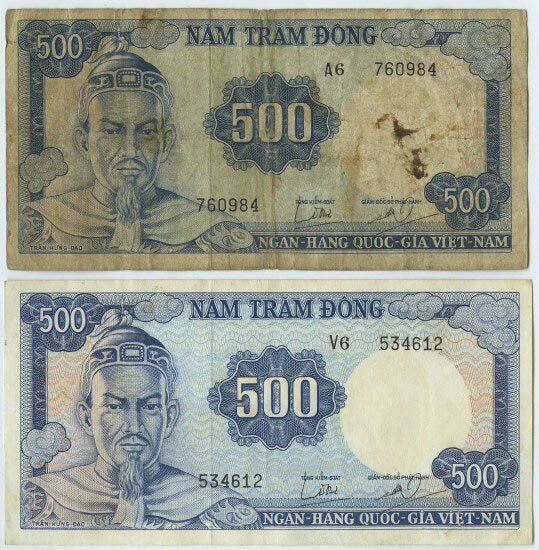 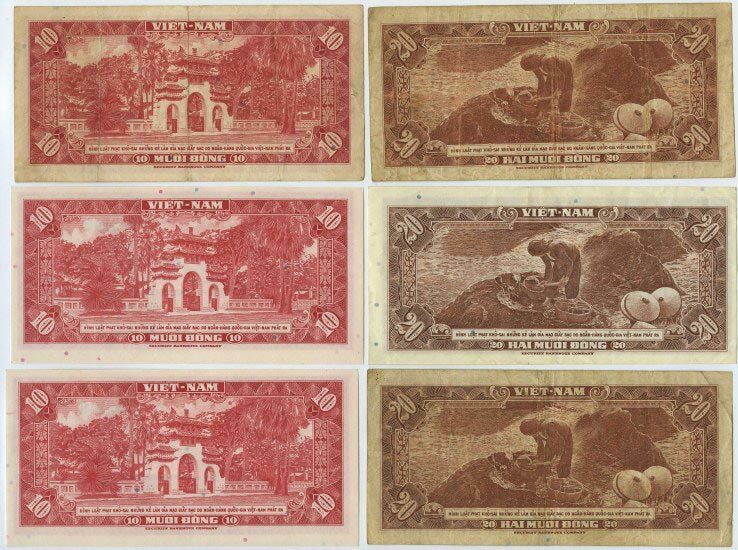 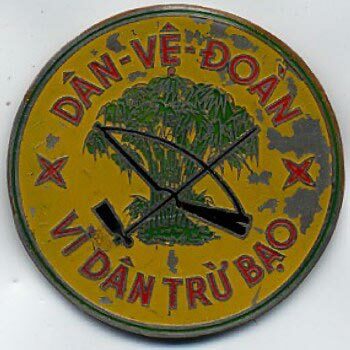 UI#182 - "VIET NAM LAOS-BURMA"
UI#192. 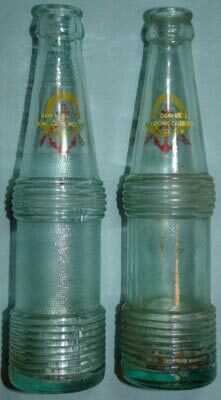 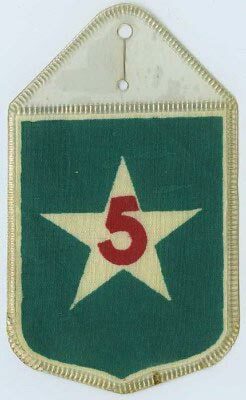 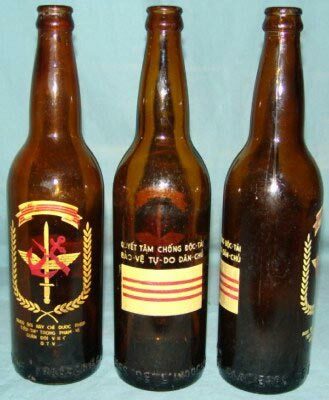 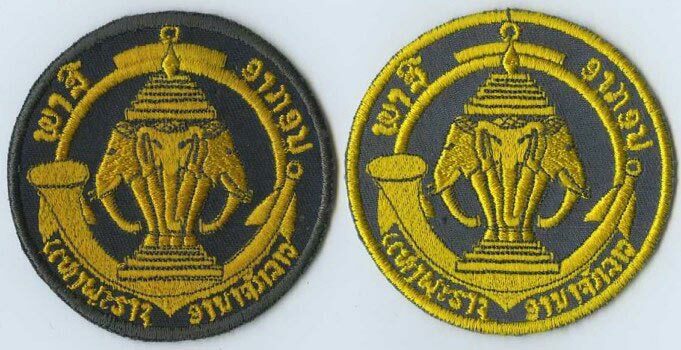 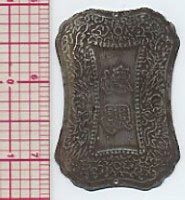 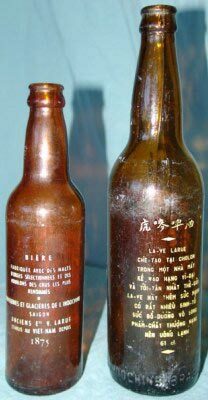 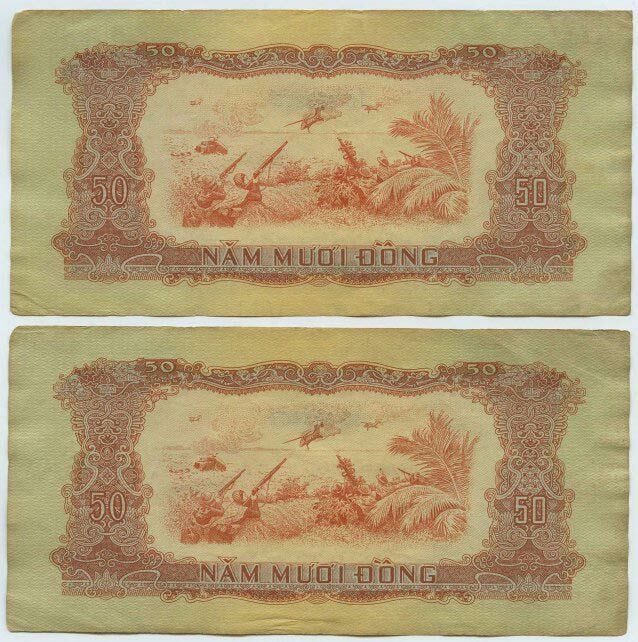 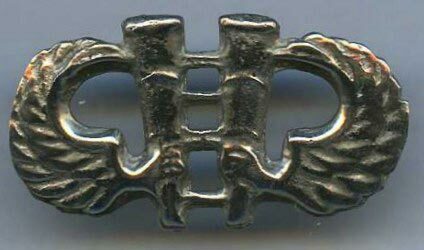 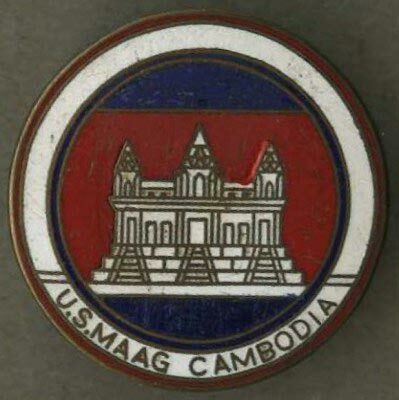 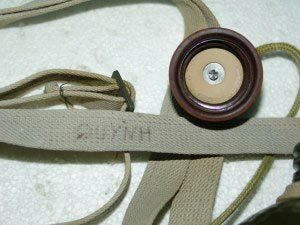 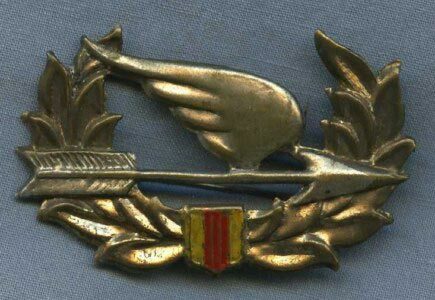 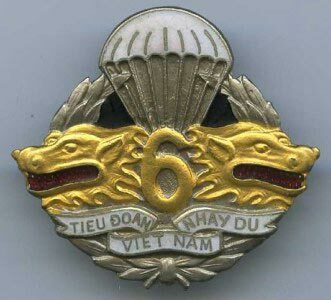 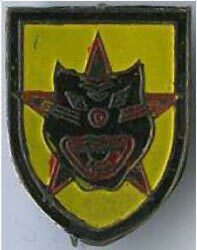 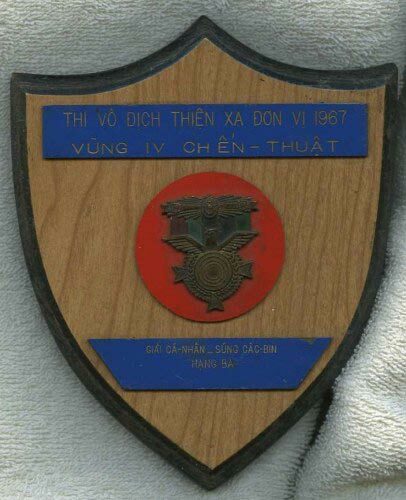 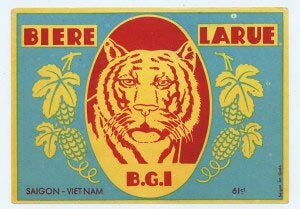 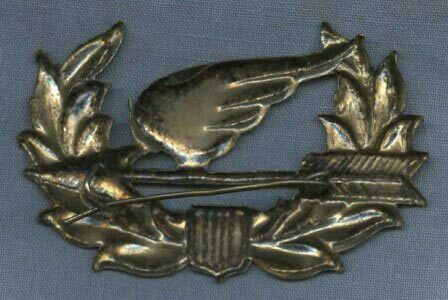 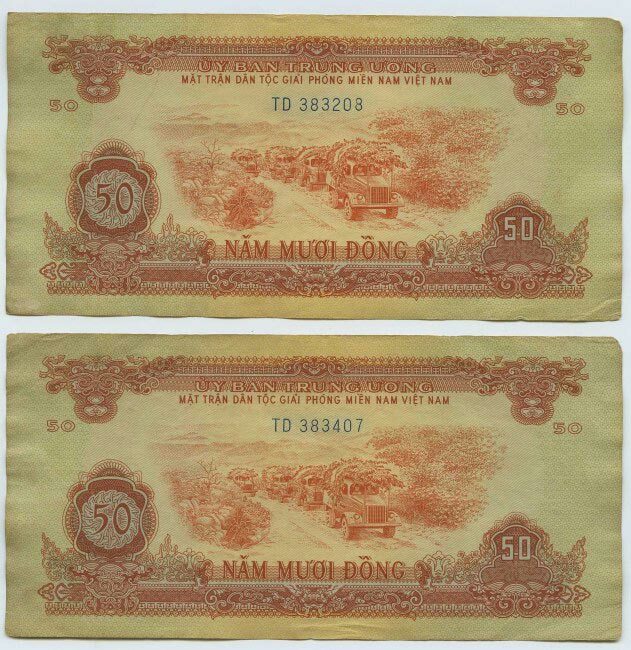 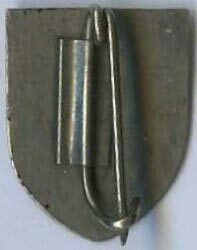 Vietnam made Beercan DI similar beercan shown in Cecil Smythe's Vietnam Insignia Book as number "59". 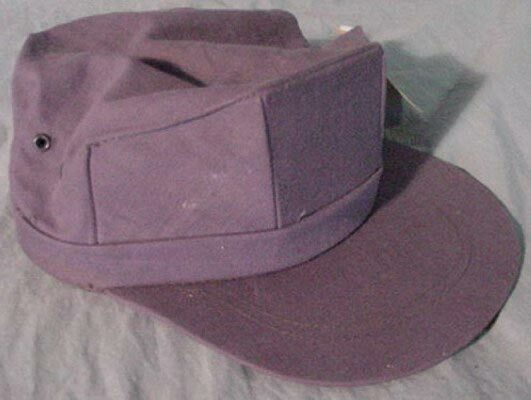 Any ideas on the ID? 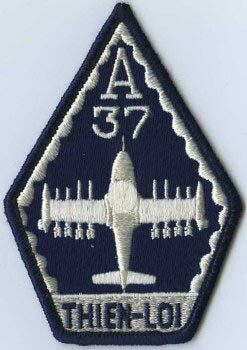 245. 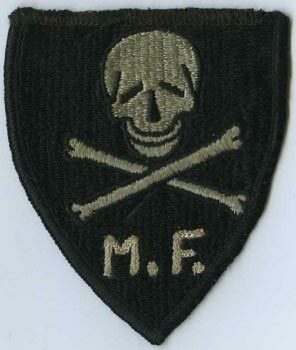 "M.F." 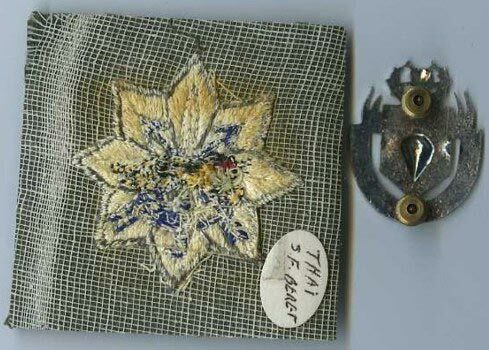 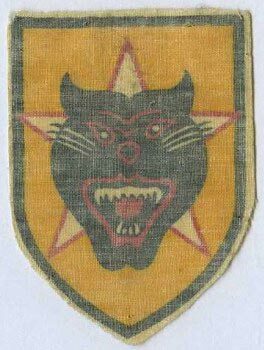 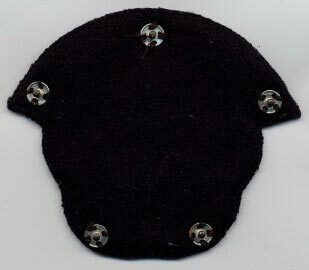 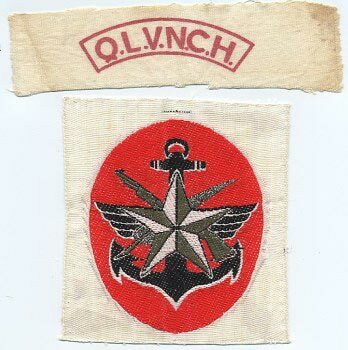 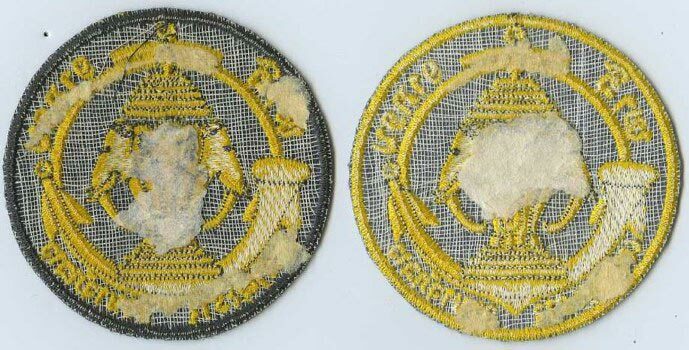 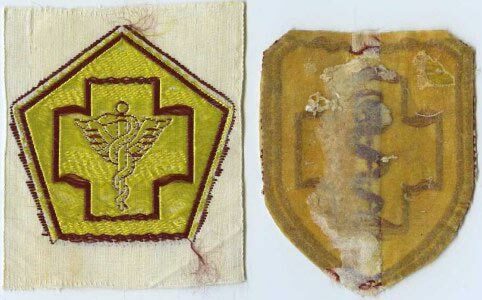 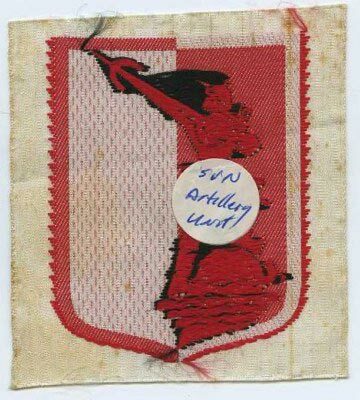 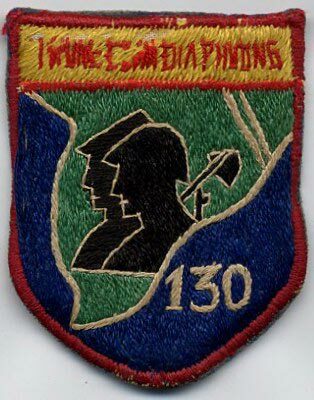 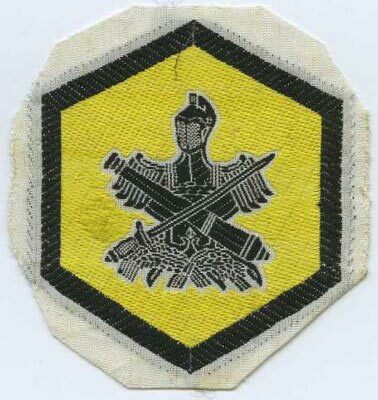 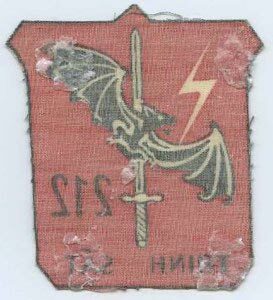 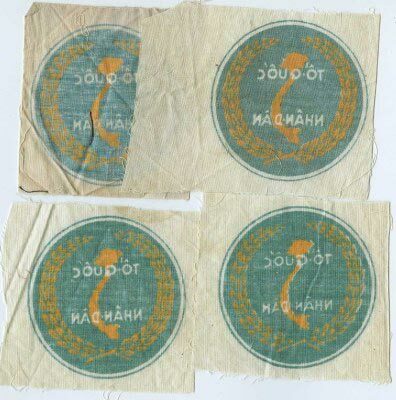 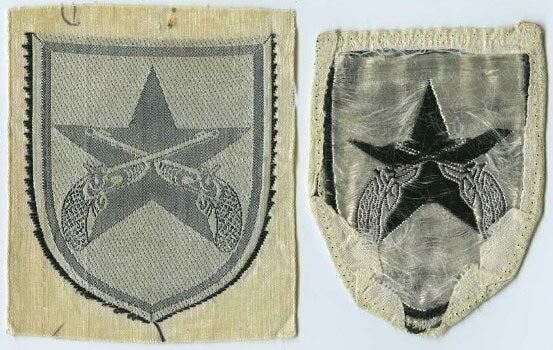 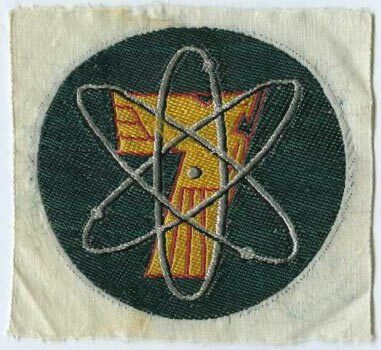 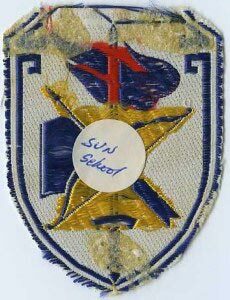 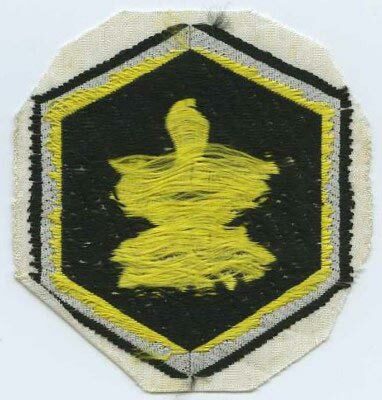 has been chain-stitched into the patch after it left the maker's shop, any idea when or why this patch was made? 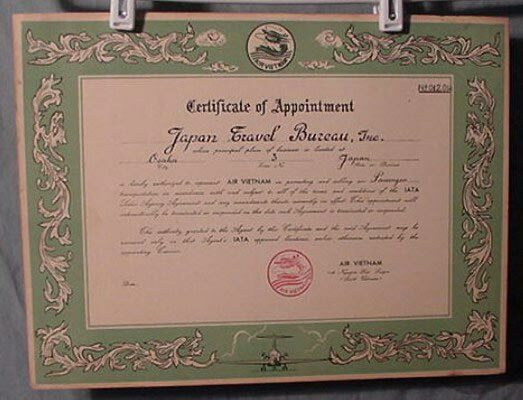 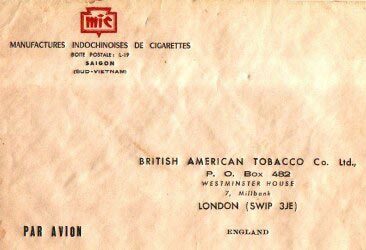 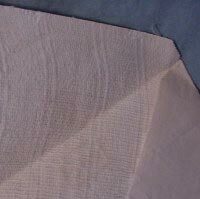 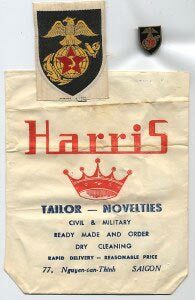 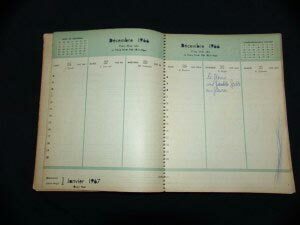 Ads, short articles, Airline Schedules, Telephone call rates, Horoscope, and etc., designed for the GI (Ads for: Tailor Shops, Restaurants, Steam & Creams, & etc. 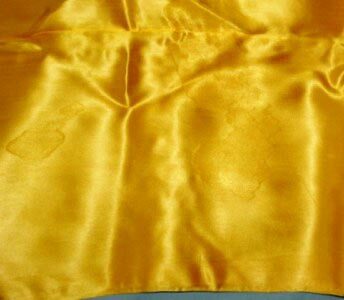 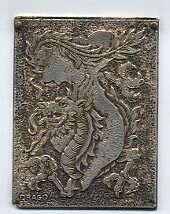 ), I have about 10 different issues, inquire for pricing and inventory. 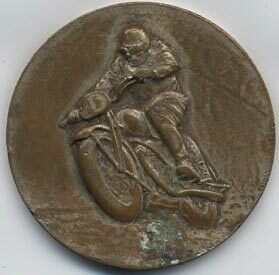 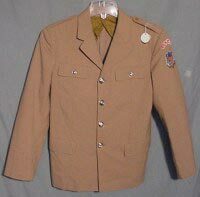 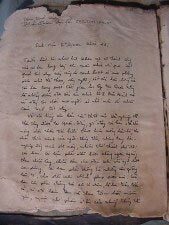 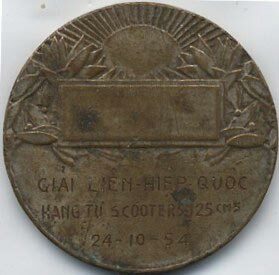 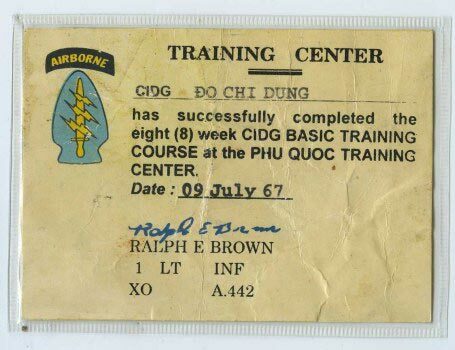 A Hoi Chanh in the Kit Carson Scout Program? 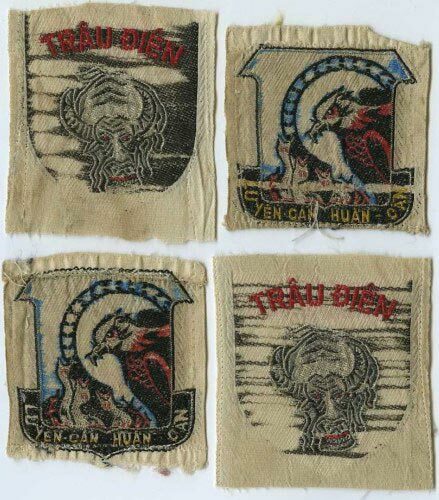 I have been told this name, "U-LEN", is a Montagnard family name.....I don't know if that is correct. 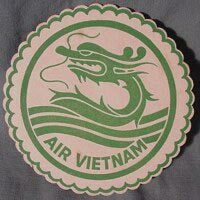 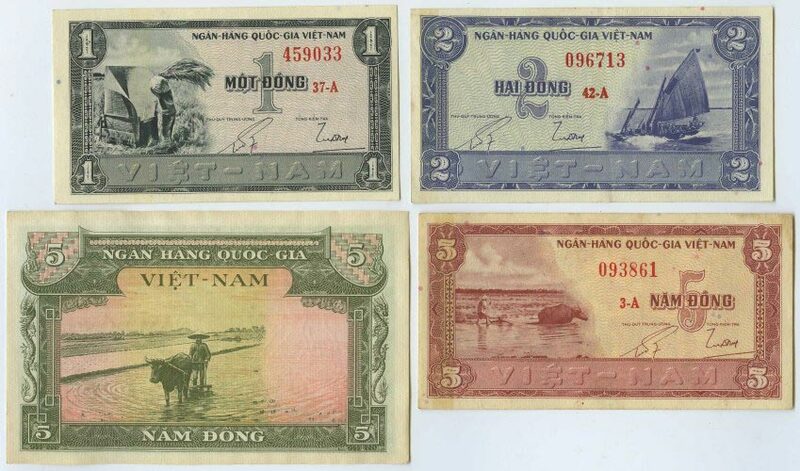 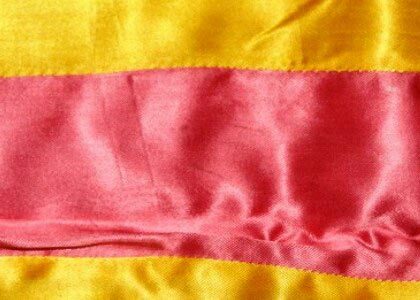 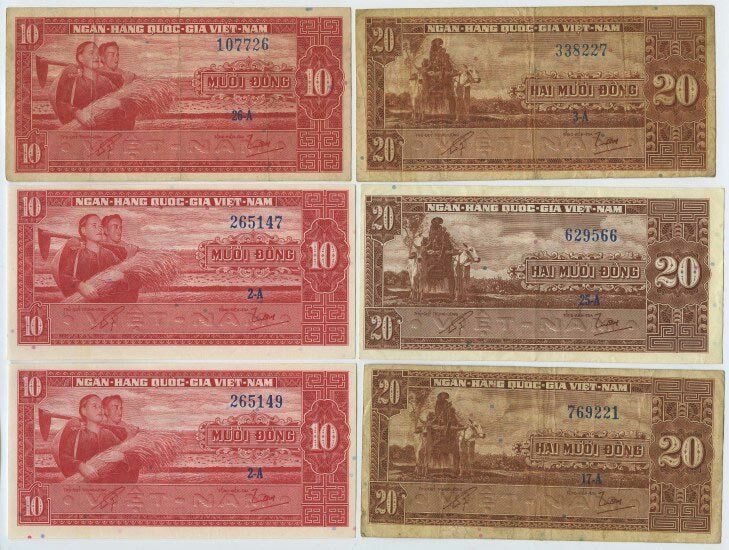 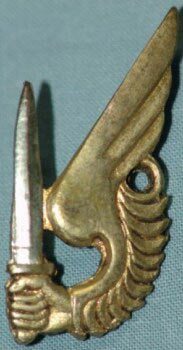 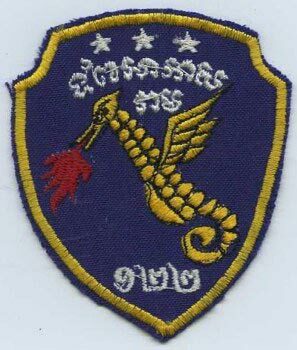 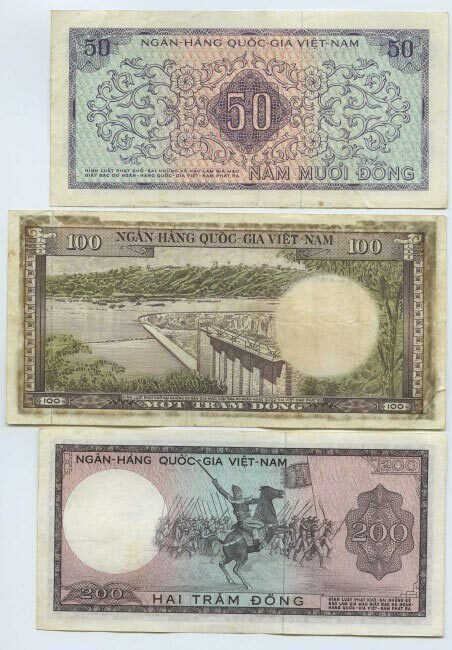 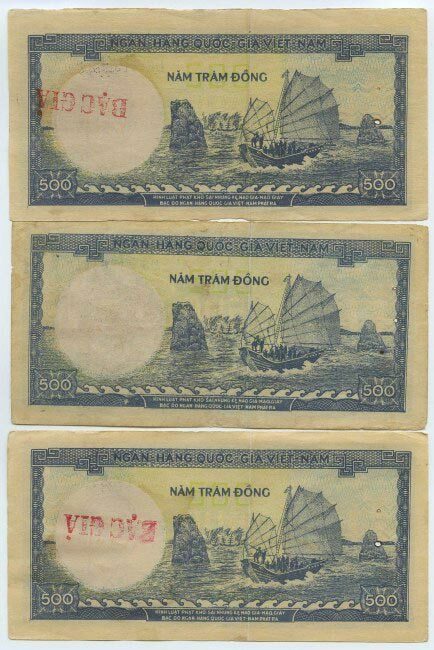 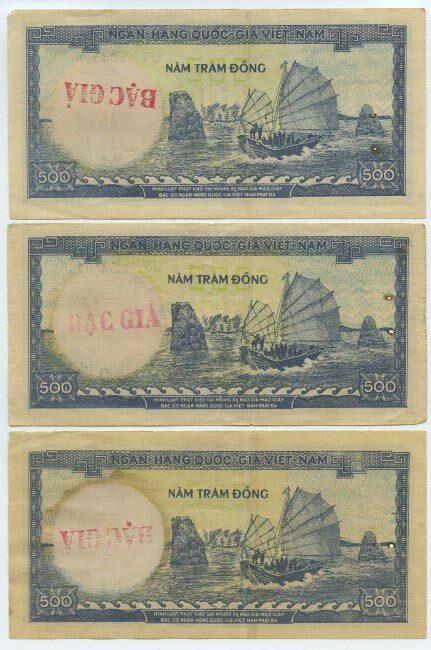 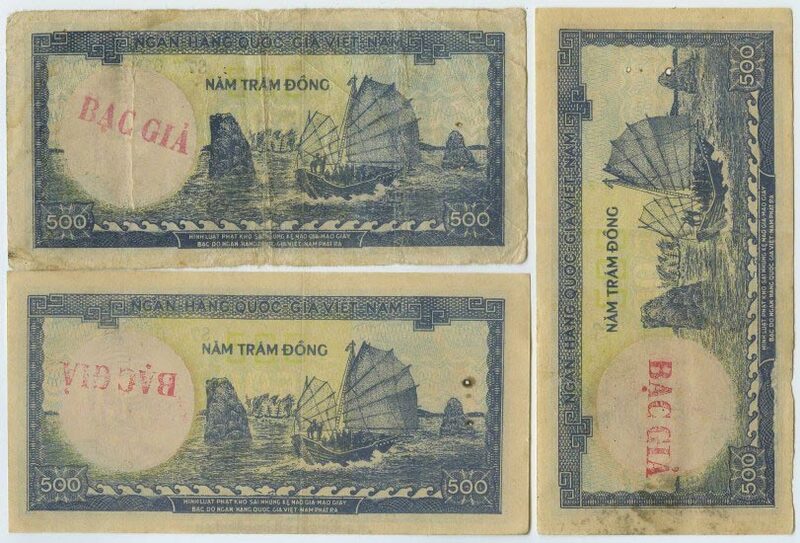 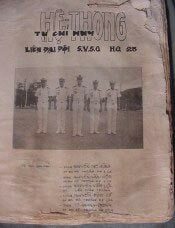 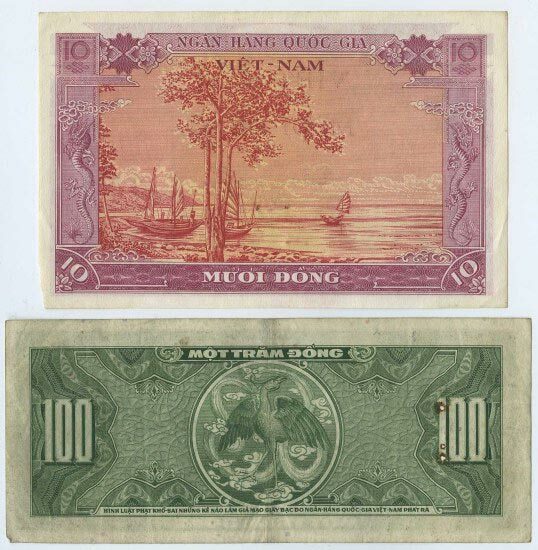 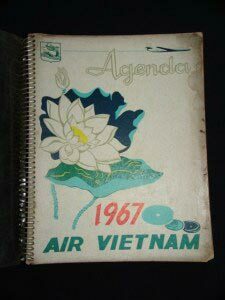 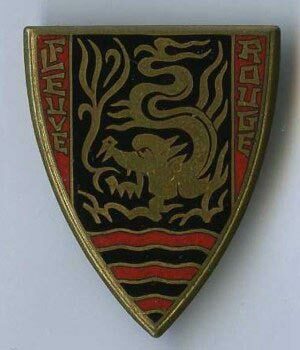 "20 Years of Development of Air Vietnam 1951-1971"
pre-1954 "Fleuve Rouge" Drago DI, "Brown Water" French Navy Unit on the Red River of North Vietnam.